There has been much discussion lately on this blog and elsewhere about the relationships among skepticism, atheism, and politics. I have roundly criticized Richard Dawkins for extending scientific skepticism into areas that are more properly the domain of philosophical analysis, as well as Penn and Teller and Michael Shermer for doing the same with politics to support their libertarian views. Of course, even a cursory reader of this blog will easily find my own pieces about religion and politics, which may make it seem like I’m a sinner throwing stones at my fellow skeptics. In reality, this debate has been going on for decades, and it has at times involved some of the great figures of skepticism. Just think of Paul Kurtz’s struggle to balance his own organizations, the Council for Secular Humanism (which publishes Free Inquiry) and what is now known as the Committee for Skeptical Inquiry (which puts out Skeptical Inquirer), organizations that most certainly not always see eye to eye when it comes to mixing skepticism, religion and politics. Michael Shermer, on the other hand, has been criticized on his own multi-author blog for not making a distinction between scientifically defensible notions and political positions. And of course, Penn and Teller’s absurd denial of global warming, and recent Dawkins award winner Bill Maher’s insane criticism of “western medicine” complete this increasingly messy picture. Before continuing, therefore, let me be clear about what it is I am trying to do. I am most definitely not seeking to tell people what to write about and what to stay away from. Not only would that be futile, but it is contrary to the spirit of open inquiry that I hold as one of my highest ideals. Besides, as I mentioned earlier, I can easily be seen as a repeat offender on this very blog, and coherence is another ideal I hold pretty high (despite one of my favorite quotes by Walt Whitman: “Do I contradict myself? Very well then I contradict myself, I am large, I contain multitudes”). What I am attempting is a serious discussion of the differences and commonalities among the three areas pertinent to the topics in question: (scientific, or evidence-based) skepticism, atheism, and political philosophy. This blog is about all three because those are my interests and because I am presumptuous enough to think that I have something relevant to say in those domains. But I am in fact continuously switching among three not automatically interchangeable hats: (former) scientist, (current) philosopher, and politically-minded intellectual. All of that said, let the game begin! Lastly, let’s consider political philosophy. Again — just like with atheism above — it would be silly for a political philosopher to reject pertinent empirical claims: we do have some evidence from the social sciences and from history about what happens when certain economic or political systems are seen at work in human societies. But political philosophy is fundamentally a matter of values: one starts with certain “rights” for instance that one thinks ought to be safeguarded, and then builds the best political/economic system that is likely to do the job. Talk of rights is, again, philosophical in nature, not empirical. One can (and should) defend what one means by “rights” and why one considers certain rights to be more fundamental than others. But all such discussions largely transcend empirical evidence (which, again, should not be ignored). If the distinctions above are so clear, why, then, do we keep running into the mess with which I started this essay? 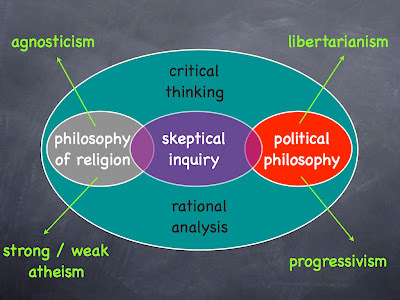 Because the three areas in question do have a common underpinning, as illustrated by the diagram accompanying this article: atheism, skeptical inquiry, and political philosophy are all exercises in critical thinking and rational analysis. The differences among them is in the relative role that philosophical and scientific/empirical considerations play in each case. That is why, for instance, I can coherently say that Penn and Teller are wrong about their libertarianism and about their position on global warming: in the first case, I am talking about philosophy, in the second about science. There is, of course, much more leeway in the first than in the second case. That’s also why there is no contradiction in me praising Bill Maher for his political views and yet thinking of him as a hopelessly inept commentator when it comes to his opinions on medicine. To consider one more example, this is also how I can agree with Dawkins’ and Coyne’s philosophical positions (and disagree with “accommodationists” like Ken Miller) and yet distance myself from them on the ground that I think they are stretching the tools of science beyond what is reasonable. All of this may seem confusing and perhaps even an irrelevant exercise in hair-splitting, but it is in fact what makes discussions within the skeptic community — and society at large — so interesting and delicate. By all means, let’s continue to argue about atheism, politics and UFOs. But let us be mindful of the fact that the types of arguments and evidence that are pertinent to one area do not necessarily carry over to another one. Which means that people should refrain from using the venerable mantle of skepticism to engage in silly notions like denying global warming or the efficacy of vaccines. That’s an insult to critical analysis, which is the one thing we all truly cherish. A friend and I were embroiled in an email debate recently over climate change. He boasted that he was now the skeptic and I was the believer (he's still fettered to some form of religion--some liberal, proprietary brand of christianity I think). Apparently, my friend has a rather puerile understanding of what skepticism involves. As you said, it is rooted in critical and rational thinking. On the first reading, I like this post. I will need to re-read it a couple of times and find out more about what you meant by Dawkins & Coyne's scientific argument in favor of atheism. I couldn't agree more that science on its own should not make a definitive decision/claim upon metaphysical questions. It is important to always have a mediating philosophy to interpret the scientific data to support a particular claim. Science on its own can never settle metaphysical questions but it can be used to provide evidence for rational argumentation to which one can perhaps make plausible conclusions after being filtered through philosophical analysis. I am going to modestly disagree with your argument that Dawkins and Coyne are overstepping the bounds of science in promoting atheism. Using the methods of science, is there any evidence that supports the tenets of any practicing religion? As far as I am aware non exists (unless we are discussing deism, but I would argue that is a fallicious approach, because that is not the religion Dawkins or Coyne are arguing against). You note that a 6000 year old earth is addressable scientifically, but that an argument can be raised to remove this claim from the scientific to the philosophical. Agreed, but I would still argue that this is not a stance made by the vast majority of fundamentalists, nor is this an argument raised by American creationists with any frequency (at least not compared to the "the facts support creation" or "the scientists lie" arguments). Thus, I would posit that without any scientific evidence supporting any of the major and minor religions, that in and of itself is sufficient justification to support a qualified atheism. It's disingenuous to describe Penn & Teller's position as 'denial' of global warming. They have certainly entertained a less-convinced position than the bulk of scientists, but I don't think you'll find an instance where either of them said it simply isn't happening. Perhaps we need a new term. "Global Warming WishyWashyists"? So to summarize, it seems OK to mix politics and philosophy in with your skepticism, as long as you acknowledge that you're doing so. Penn & Teller certainly do that. Dawkins doesn't seem to. Shermer sometimes does, but hasn't recently on his skepticblog.com posts about libertarianism (which I somewhat agree with, but think they should have been posted elsewhere). I'm not sure I agree with this. I think one needs to be mindful of the needs of the skeptical movement, and be VERY VERY clear about the distinctions between these areas of inquiry. Otherwise we risk alienating a large portion to the people we could be helping. I almost agree with you, with 2 caveats. It's true that almost everything about religion has a scientific claim (if not a testable hypothesis) associated with it. So, no, there was no exodus from Egypt; no, the world is much more than 5770 years old; no, nobody can walk on water. You will, however, still have people (say, deists) who will cling to god's existence (even if they abandon all other religious trappings), and then there's nothing scientific to talk about. So, point 1: there will always be a core 'god exists' claim to religion that skepticism has nothing to say about; and point 2: from a purely strategic perspective, skepticism gets shut down by the vast majority of people if it's perceived as atheistic. We can do much more good if we ignore that issue for now. There are plenty of secular humanism (etc) groups to fight that fight. I have been troubled by the tendency of many well know scientist to intentionally venture outside the realm of evidence-based approaches. It seems some, like E.O. Wilson and Dawkins, intentionally use their scientific credibility to bolster their non-scientific philosophies and wanderings. In such cases I am left with specific questions. What affect does this have on the "authority" of science and its figureheads? (I tend to think it erodes the delicate shores of scientific inquiry in the states, though I have no evidence to support such gut reactions). Why do many scientist feel the need to expand the role of science so dramatically? What affect does this have on how the scientific community accurately defines anti-science, etc? I fear Dawkins and the like ultimately provide a disservice to both academic science and science education when they intentionally try to extend its boundaries. Isn't the American relationship with science already tenuous enough? Then again, I must admit, science has rarely been a static arena. Maybe we a seeing a shift of some sort that expands on the limited boundaries that I tend to understand. This may partly be a terminological dispute. Why assume that "skeptical inquiry" is synonymous with "scientific skepticism," rather than with "critical thinking and rational analysis"? It seems to me that skeptical inquiry includes philosophical and historical methods, not just science. In your diagram, "atheism" is the only circle labeled with a specific position rather than a methodology--shouldn't it be labeled "philosophy of religion?" Claims made by atheists or reasons people are atheists would be a circle that would have components outside of the "critical thinking and rational analysis" circle, while claims made by theists or reasons people are theists would have some overlap inside that circle. scott_ metaphysical questions are one thing, but science certainly can be applied to metaphysical claims. It's pretty easy actually: "Where's the evidence?" Agreed with The Lorax on Dawkins/Coyne. I think you are misstating their arguments. With regard to your example, are you saying that Dawkoyne make non-empirical claims? It seems to me that their scientific arguments against theism leave them as de facto atheists, not philosophical atheists. I know Dawkins has repeatedly said that he would believe in God if he saw Him do something outside the laws of nature. Actually, I'm not sure what philosophical atheism means or who fits this category. Yourself, perhaps? Please explain. BJ - Point 1) Skepticism, by definition, says "prove it" to the god exists claim. Point 2) Accommodationism is actually a tactic, which I disagree with. Atheists will never be perceived better by hiding. Phillip - just what are Wilson and Dawkins' non-scientific wanderings? Again with the accommodationism. Click the Ken Miller link above. Actually, after reading Norwegian Shooter's comment, I would revise my comment above about how the "atheism" circle should be labeled, though not its location. It should perhaps be something like "religious views" or "views on religion," which would underscore the fact that it does overlap with "skeptical inquiry" even if that's restricted to science. 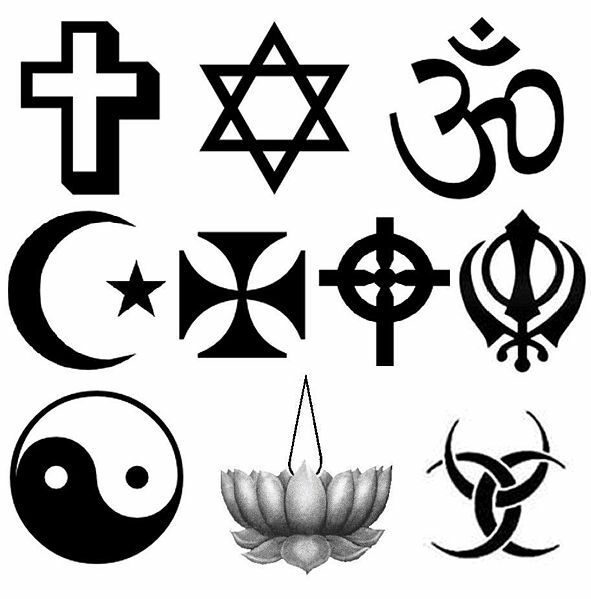 Science can certainly study religious views and practices as a cultural phenomenon. "Second, let us turn to atheism. Once again: it is a philosophical, not a scientific position." Let me argue with this position a bit. It may be that it is only that I define things differently. First, what do I mean by theist? Someone who believes in a personal and interacting god, the God of Abraham specifically. By atheist, I mean someone who lacks those theist beliefs. What I don't mean by atheist is someone who denies the possibility of existance for every possible definition of god. The next point is that theist beliefs involve some very specific claims about the nature of the universe, how it works, and its history (including our own). Let's take a look at the Christian doctrine of the power of prayer, for example. This is a very core doctrine for Christianity, not an optional sideline. If it were true in any respect, it would require a different set of laws of probability for believers and non-believers. The list of testable claims that can be drawn from the tenets of theistic belief is long. Yet, I can think of no tenet of theistic belief that is amenable to comparison with reality is supported by the comparision. The rejection of theistic belief seems to me a position completely supportable by scientific argument. When I say that I am atheist, that is what I mean. I don't think the borderline between science and philosophy is so sharp and well-defined. Indeed, there is no conceivable way to falsify the idea that God forged the fossil evidence to make the world look older, but the same holds for any number of natural or supernatural conspiracy theories. I don't think you have to be a philosopher (per se) to make that argument, as falsifiability is an important consideration in science as well. What about the idea that there are elves in my backyard who disappear magically every time someone is watching? I would say the difference is a matter of degree, which I think is implicit in your diagram as well: the same tools of 'critical thinking' and rationality apply in both disciplines. Science is also involved with logic and abstract reasoning, but the emphasis is on empirical arguments. In the case of 'philosophical' matters, the balance tips to the other side. I like my skepticism and atheism like I like my TV dinner meal, all on the same plate, but separated into their own compartments. Although my atheism, like my peas, frequently cross over the sectional barriers to mix with my mashed potato/skepticism. Nicely done. I think your example of Kurtz with CFI is excellent and well understood by someone like me who's been a reader of both journals for over 15 years. The [On the scope of skeptical inquiry] I think is a bold statement and concise rendering of the issues. I do have areas to nit-pick, but I'm sure you'll have your hands full with this one. I tend to agree with Massimo on a couple of points raised by his blog. 3. Many commentators here insist that the dispute between religion and science rests on evidentary claims. Why should one believe x, without sufficient evidence? Would it even be moral to do so? This was the position of the British mathematician William Clifford. However, the American philosopher William James responded that on one hand, Clifford was right, one cannot, or shouldn't believe in things, that haven't been proven "right": the Earth being four thousand years old, or the Sun moving around the Earth, and so on. Yet, for things there isn't (in some instances) a "wrong", like superstring theory, one is free to "believe" it, until, or if and only if, proven, otherwise. I've posted a commentary on this post at my own blog. I tend to agree with you most of the time. But I do feel like you did not do what you set out to do in this entry. You did not define what you mean by atheism (on purpose I assume you do not want to get into a semantic war with anyone) and that is crucial to this discussion, for as we know there are many varying definitions, and depending on which one you choose, the rationale will change. Here's my take on the issue. This screws with my understanding of philosophy. How can philosophy, the subject that deals with “that to which there is no answer”, address existence claims? Why do you believe we have only some? Do P&T and Michael Shermer really claim that private property rights come above another person’s right to exist? I suppose it’s possible that they do, I’m not very familiar with either of their work, but I find it hard to believe they would say that. (I doubt many people who call themselves libertarians mean to say that.) Regardless, this is the kind of thing you can disprove with values. Before we even enter into a discussion about what economic system we should use we all pretty well agreed on what we value- lifting up the populations standards of living. Now, how do we know what system will best accomplish this goal? It mostly comes down to evidence. Massimo, you forget once again to place what matters most: belief in the LORD our GOD. It is HE that grants us all of the things you so honor. Those who will not recognize the Bible as the cornerstone will use all of the things you describe for their own selfishness. They will sacrifice the flesh of the unborn and GOD will have his vengeance. Get released from the addiction on everything that you can´t reach. In your life, in your understanding of everything, in all you experience, YOU ARE GOD. No one will decide, act, or experince anything in your life, besides yourself. Loose the excuses that stops you from moving on. Live your life, don´t judge, and be happy. You are free even to believe in anything you want, but don´t get blind! "When someone...wants to make a scientific argument in favor of atheism...he is stepping outside of the epistemological boundaries of science, thereby doing a disservice both to science and to intellectual inquiry." I couldn't disagree more. The scientific argument "in favor of atheism" parses out to mean, etymologically and actually, an argument in favor of non-belief in the theism proposition. It couldn't be more fundamental: No evidence, no phenomenon to investigate, Q.E.D. Scientists are well grounded within the epistemological boundaries of their discipline when they ignore ideas for which there is no evidence. Please explain why that argument is either unscientific or inconsistent. With regard to the philosophy of science (and logic in general), even well-informed people regularly commit the error of conflating non-belief (a neutral, or more accurately, null position) - a concept implicit in the term "atheism" - with disbelief, which is the assignation of a negative belief value to an idea. (Maybe that's what you have done in this instance?) Science, by its very nature, favors a null viewpoint on any claim for which there is no evidence upon which to base an evaluation. Naturally, nothing about the nullity of a scientific viewpoint on theism precludes the legitimacy of addressing the matter on a more broadly philosophical basis. In fact, it's entirely appropriate to do so. This is precisely what Dawkins did. He certainly didn't just ignore the idea, which would have been scientifically appropriate. His argument is much more involved. So to the extent that he claimed his argument was scientific, he stepped outside science's epistemological boundaries. Perhaps he thinks science holds the only set of keys to the logic stronghold. But that doesn't make his arguments invalid. They may be entirely logically consistent - just not scientific. Inasmuch as he disparages philosophers in general as having nothing to say on the matter, holding up a copy of The God Delusion and saying, "Et tu, Dawkins," would seem to be the appropriate response. I'm not familiar with Coyne's argument, so I can't speak to that. I can appreciate others' interest in constantly re-raking the coals of the debate, and it's certainly important to do so for cultural, societal, and other reasons, but I'm not particularly inclined to follow each fresh new approach to what amounts to (for me) a substanceless matter. The idea of theism is pretty much as settled a matter in my mind as it can be at this time, and it really pretty much boils down to the fact that, while I can't know for sure, in the absence of evidence I prefer not to assign a belief value to the proposition. Your impression was fundamentally unsound. (Excuse the redundancy.) Nicely done. Two things occurred to me upon submitting my last post. "No evidence --> nothing to investigate --> no support for the claim, Q.E.D." Second, we really should use language as precisely as possible. Yet we don't have a term in common usage to distinguish between atheists (null-believers) from people who actively assign a negative belief value to the theism proposition, because the logical choice would be "antitheists", which is as inflammatory among certain groups as being "anti-choice" in the abortion debate (even though entirely as accurate) or "anti-life" (which is not). Nobody wants to be an "anti". As a result, we stick to the more "safe" practice of lumping both categories together under the less offensive "atheist" term. But this occludes the matter and makes it more difficult to move the discussion forward. If antitheists and atheists were presented as distinct groups, it would help prevent atheism - a logically defensible position - from coming under the intense fire more appropriately targeted at antitheists. As the distinction became more well-understood in society at large, the debate might actually stand a better chance of advancing. Thinkers and people of integrity on this and other subjects really should strive to dispel misconceptions and bridge the gap between reality and common perception at every turn by insisting on proper and precise use of language. I agree completely with regard to politics. They are fundamentally based on different interests and values which cannot be decided to be right or wrong with the tools of science. In contrast, I fail to see what the religious faith counterpart is to what you call "values" in politics. The existence of gods is a purely factual question: either they do, or they don't. And for factual questions about the nature of the universe, science is not only the best, but the only demonstrably workable way to go. Note also that atheist scientists like Richard Dawkins and Victor Stenger never profess to prove the complete impossibility of the existence of any possibly conceivable god. What they do claim are two things: First, every individual proposed deity is a scientific hypothesis that can be tested scientifically. Sometimes a god is ruled out definitely, sometimes only probabilistically, beyond reasonable doubt. Second, we can look at the universe and conclude that we can explain everything we observe without reference to the supernatural. This is, again, a scientific process. The only way philosophy enters at all seems to be the old question of how we know that things like science and Okham's razor are useful tools to understand the world in the first place. Some people, especially those of a postmodernist persuasion, argue that this is a leap of faith just as for other ways of knowing (as, say, revelation), but that is obviously untrue. Science produces consistent and useful results, i.e. it works, in contrast to basically everything else; that is all the justification I need, and again philosophy does not enter the equation. As far as science goes "there is no god" is a verified fact. It's not even that there is nothing to investigate, there is lots to investigate and it's all turned up nothing. Every single "act of god" that can be verified or proven false has been proven false. We have thousands of religions, hundreds of gods, and billions of "followers" and yet not a single verifiable fact from all the dogma that would point to the existence of god. The only logical conclusion for the rational is that there is no god. Sure with philosophical pursuits and semantic arguments you can try and argue that god exists in such a way as to prevent any logical examination of his actions. But those arguments should not hold any sway over the scientific fact of his non-existence. You can argue semantically that god is nature, but then you are essentially neutering the idea beyond any possible recognition. "As far as science goes "there is no god" is a verified fact." "Because there appears to be a lack of evidence for one hypothesis, another chosen hypothesis is therefore considered proven." You said yourself that not one verifiable fact would point to the existence of a god. This is lack of evidence in favor of the theist proposition. It is logically inconsistent to construe this as positive evidence in favor of the antitheist proposition. Lack of evidence is not evidence of lack, which is why disbelief and non-belief are not the same thing. From the scientific perspective, neither the theist nor the antitheist propositions even make it in the front door, for the simple reason that we have no evidence-based way to test them. Thus, they are not scientific theories. All we can do scientifically is assert that there is no support for either claim, which is the totality of the atheist position: a nullity of belief in theism. Antitheist proposition: "God does not exist." I like your writing, and your argument is very familiar to me (as you may have discerned from my "atheist arguments" regarding the "supernatural" posts). However, I don't know what the heck you're talking about (and I'm still waiting for a 900 foot Jesus to appear). It appears you are defining atheism as "without belief in a deity" (or "withholding belief", anyway, not the positive assertion as atheism meaning deities, gods, what have you, do not exist?) sort of thing, correct? So, then you are saying it is correlated to the scientific null hypothesis, no? If I'm right above, you're not making a scientific argument FOR atheism. You haven't falsified the deity, god or whatever so far (meaning the supernatural - and I don't mean it has to be done empirically, like we refuted the earth being 10 days old). The null hypothesis (if that's what you're thinking) does not say what you withhold believing in with regards to what we have no knowledge about (the claim effect is from a "god" or "supernatural" force which no one has never substantiated - it's simply meaningless to science and a cop-out to claimants). Again, you're withholding belief in other peoples belief in the "supernatural". Or saying we can dispute claims to "supernaturalistic" causation, to which you could use the null hypothesis - but that's stretching it because what is claimed to be causing said effect is easily put beyond what is detectable simply because we know nothing about it (which appears to be Massimo's point). There's absolutely no reason to bring science into this. I apologize if I'm miss reading you and also to anyone reading this because I'm tired and I'm absolutely sick of going over this crap (so I'm just throwing it out there). Again, I apologize if I'm way off base here, but if not.. Here's what I think is a nice, short, and concise defining of the null hypothesis. Of course some of my words look nutty, to me anyway (and I'm guessing many others), but that's the things, dragging science into the "supernatural realm" is B.S. Experimental biology often involves setting up an experimental treatment and — at the same time — a control. Then one compares the results of the experimental treatment with the results in the controls. If there is a difference, what is the probability that it is due to chance alone; that is, the experimental treatment really had no effect? The hypothesis that the experimental treatment had no effect is called the null hypothesis. Most workers feel that if the probability (designated p) of the observed difference is less than 1 in 20 (p = <0.05), then the null hypothesis is disproved and the observed difference is significant. "The argumentum ad ignorantiam [fallacy] is committed whenever it is argued that a proposition is true simply on the basis that it has not been proven false, or that it is false because it has not been proven true. A qualification should be made at this point. In some circumstances it can be safely assumed that if a certain event had occurred, evidence of it could be discovered by qualified investigators. In such circumstances it is perfectly reasonable to take the absence of proof of its occurrence despite searching, as positive evidence towards its non-occurrence. (Copi 1953)"
When god or gods are omnipotent, creator(s), and influential in the lives of billions of people every day I believe it's safe to say that the lack of evidence does point to the perfectly reasonable negative induction that he does not exist. Not one fact nor experiment points towards his existence or his unseen hand on anything or anyone. Massimo. I was drawn to this site some time ago due to a Google search about the paranormal. I have a related question for you. Do you believe that the earth is now or has ever been visited by creatures who came from another planet or dimension? Have you ever written about your opinion? Have you spent any time studying the evidence, either in favor of the proposition or against? I recently read the complete transcript of the 2007 "UFO Disclosure Project" from the National Press Club. The testimony and other evidence is VERY compelling. I'm also curious because, even though your politics are backward, I do respect your opinion. Besides, you like the blues, lived in Tennessee, and came from the country with the greatest food/coffee/people in the world! It becomes a bit of a logic game, doesn't it? At a certain point, defining terms becomes more than half the battle - but that's where we get to the marrow. Yes, you understood correctly that I am treating the term "atheism" as meaning "without belief in a deity". I do this for the simple reason that that (and only that) is what the etymology dictates, and we require a word with that meaning. Deviating from that core definition invites all manner of gate crashers into the clubhouse, confusing what should be a very straightforward concept. But I don't correlate it with the null hypothesis, or any scientific hypothesis, for the specific reason that the theist proposition offers nothing whatsoever, not even a toehold, for science to get a grip on. So in fact, I am agreeing with what I believe to be your (and Massimo's) true position, that science has nothing to say about theism. That is precisely why atheism is the appropriate scientific stance on the matter. Science, by its very nature, favors a null viewpoint on any claim for which there is no evidence upon which to base an evaluation. To preclude this by claiming that it is out of bounds is to assert that it is a scientific misstep even to acknowledge the existence of claims that it has no means of investigating. But this is absurd. How, then, would a scientist know which claims can be investigated and which can't? Is science to be leashed and muzzled by some external factor in this fashion? Nonsense. The claims are observable, which makes them fair game for science to acknowledge and assess. Not only is it in-bounds, but it is fundamental to science to be able to determine which claims meet the criteria of scientific hypotheses and which don't. If Massimo had said that making a scientific argument against theism, instead of "in favor of atheism", is out of bounds (or if he had used the word antitheism instead of atheism), then his statement would have been correct. But lumping antitheism and atheism together is logically incorrect, it amounts to philosophical gerrymandering, it muddies the waters of the discussion, and socially it weakens the atheist position immensely. You're entitled to your viewpoint, but I still disagree. But this is not really the point. The point is, the theist proposition cannot be investigated "in the raw". That is, although we can investigate claims of divine intervention when we have information about the events they pertain to, at best this goes to the question of action, not existence. One must exist in order to act, not the other way around, so disproving an action by an entity is not at all the same thing as disproving the entity's existence. You can't get at the root by hacking away at the branches. At this point I suspect that you may have an attachment to the idea that god doesn't exist - that, in fact, you find theistic belief offensive. If so, be careful of this, as it will tend to inject bias into your views. But that's precisely my point. In The God Delusion Dawkins makes a big deal of the assertion that he is making a *scientific* not a philosophical argument. Same for Coyne. no, "there is no god" is not at all a verified fact. That was the whole point of my distinction. Any decent philosopher of science would tell you that even a lot of scientific statements about the world are far from being "verified facts," let alone a metaphysical statement like god exists. When you say that it is perfectly reasonable to conclude that there is no omnipotent and omnibenevolent god you are correct, but that is a philosophical conclusion, not a scientific one. no I don't believe in ufos, past or present. The reasons will be presented in a chapter of my forthcoming book, Nonsense on Stilts. I have a huge problem with the whole idea of null hypotheses, and so do many philosophers and scientists. References in my "Making Sense of Evolution," or in Sober's latest (Evidence and Evolution) or in Shipley's "Cause and Correlation in Biology." And by the way, Dawkins *has* to make a statement against theism in order to support his atheistic position. The claim "there is no God" is not a verified fact, but as you say, the same holds for even many scientific statements, so this problem doesn't single out supernatural ones. The mere fact that it's not possible to 'verify' something doesn't mean that we cannot possess evidence for or against it. The interesting point, which I think you disagree with, is that if there were a God, it would not be terribly difficult to find evidence for his existence by scientific means (I don't say 'verify' his existence). Consider those double-blind RCT-trials investigating the therapeutic power of prayer. If the Christians are right and a loving God exists who answers our prayers, we would expect this to become visible through trials like these. What if the results of these trials were in favour of the healing power of prayer? The qualification in Eric's quote about the argumentum ad ignorantiam captures the point neatly: if you don't find the evidence for divine interference you would expect, despite searching, that is an argument for atheism. (unless you retreat to a Deist God who never interferes with the world, but such a God is completely irrelevant for our earthly concerns and is not the one theists are talking about). One thing which you haven't really touched on is that Dawkins and other scientists (in the "scientism" sense) have some good reasons to avoid endorsing Philosophy or admitting that their arguments against the existence of God are philosophical. "Philosophy" is understood by philosophers in most American philosophy departments as meaning "analytic philosophy". Others don't hear it that way. "Philosophy" is just as likely to be expected to refer to Slavoj Zizek, Gilles Deleuze, Cornel West, etc - you know, unrigorous crap. Richard Dawkins and Steven Pinker have both devoted non-trivial amounts of time to trying to debunk ideas from postmodern philosophy. To them, a philosopher isn't somebody who wants to solve logic problems, it's somebody who wants to 'critically locate ideology within the absurd society of modernism' (etc). And you might also understand why a lot of people think that science bleeds into analytic philosophy. Analytic philosophy usually involves chains of reasoning that seem fairly mathematical or empirically sound, so to a lot of people, analytic philosophy seems to just be a form of science that requires significantly less government funding. I'm not saying it's right for them to say that their arguments against the existence of God are scientific. I'm just saying that it's not totally beyond respect (which is what you seem to think). >> that doesn't make [Dawkins'] arguments invalid. They may be entirely logically consistent - just not scientific. > But that's precisely my point. I agree with you on this part of your point, as I thought I made clear. But what you said was more sweeping than that. You expressed the view that all arguments in favor of atheism are outside the epistemological bounds of science; you only cited Dawkins and Coyne as examples, not as models for a specific subset of arguments in favor of atheism. I maintain that it is entirely scientifically valid and, indeed, fundamental to the discipline to favor withholding belief on any claims that cannot be scientifically investigated. Atheism is nothing more and nothing less than the embodiment of this position with respect to theism. The ability to evaluate claims to determine whether they meet the scientific benchmark is, and must be, native to the sphere of scientific inquiry. It seems like you are arguing against this, but I cannot fathom why. Were it otherwise, scientists would first have to pass claims (including their own!) to a philosopher or some other authority for approval before they could investigate or even comment on them. > And by the way, Dawkins *has* to make a statement against theism in order to support his atheistic position. This is beside the point. That Dawkins went beyond purely scientific inquiry to arrive at his atheistic position has been established. Whether or not he had to invoke anti-theism to reach his conclusion does not affect this. More importantly, neither does it establish doing so as a requirement for all atheistic arguments. Induction does not work in this case. > I have a huge problem with the whole idea of null hypotheses, and so do many philosophers and scientists. I did not invoke a null hypothesis, and I specifically rebuffed this notion when it came up. Atheism is a position that precludes hypothesis. It says that the claim does not meet the base requirements necessary to establish a scientific hypothesis. Massimo, is it possible that we disagree on nothing more than the definition of atheism? A minor tweak of that single term can flip us back & forth between our two views. It seems the most likely cause of our disagreement. Thank you for your post. You bring up a very pithy point in support of the importance of using language precisely (and fine-tuning it on the fly). While I don't think it pertains to the specific issue I'm addressing, I think it potentially casts a very clarifying light on the subject matter generally. On reading Feynman, Dawkins, and other "superstars of science", I often encounter precisely the type of anti-philosophical bias that you refer to, and it makes me cringe. What seems to be lost on the individuals purveying this bias is that their own justifications for it tend to be not scientific, but philosophical in nature. as you know, we have to disagree on this one: of course the fact that science has epistemic limits of its own doesn't constitute a demarcation line between it and metaphysics, but I keep not seeing any good reason - theoretical or pragmatic - for wanting to push science's reach in territory where it can do little good. As you also know, this is actually a new position for me (a demonstration that I am capable of changing my mind!). the possibility that Dawkins and Pinker overreact against philosophy because they equate philosophy with postmodernism is their problem, not mine, and further evidence of their simplistic scientism. They ought to know better, and indeed some of the best criticism of postmodernism comes from philosophy, not science. sorry, obviously I misunderstood your reference to null hypotheses, hence my irrelevant comment. Still, I don't think we disagree on the definition(s) of atheism. My point is simply that a good separation between natural and supernatural saves a lot of unnecessary trouble to science, engages philosophy, and *still* leads to a science-informed (but philosophically grounded) rejection of atheism. Here is a reaction from Jerry Coyne..
"But then he goes on to assert that the atheist position is not one that derives from “skeptical inquiry"
He then defines atheism, the obvious next course as we've seen here. The weak - "withhold belief"
The strong - "no god"
Then says: "Now I don’t know anyone who is a strong-sense atheist." That's a bit strange since I've seen people on his blog, this one too, say they are making an argument (scientific or otherwise), or just state, that they hold that god does not exist. Then we have a "very weakest" (weak sense atheism) WSA (lol!) - "no evidence for god". He then argues the "weak sense atheism" is scientific because would we say it's a "philosophical position" (his quotes, not mine) to hold that the Loch Ness monster likely doesn't exist. Of course, where else do you go from here, to deism of course. At least he didn't say, as he has: "supernatural phenomena are not completely beyond the realm of atheism" and another one of his "what if" scenarios about what would convince him that a "supernatural force"/god exist, like his Jerry "The 900 Foot Jesus" Coyne" (Oral Roberts inspired). Correction, kind of funny though. "supernatural phenomena are not completely beyond the realm of science"
> My point is simply that a good separation between natural and supernatural saves a lot of unnecessary trouble to science, engages philosophy, and *still* leads to a science-informed (but philosophically grounded) rejection of atheism. Second, the fact that you said "science-informed", and not "science-based" or just "scientific", suggests to me that you are focusing on arguments that incorporate elements from outside the scope of science, thereby altogether sidestepping my argument that there exists a scientific approach that is sufficient to establish the atheist position (which I reiterate is not a rejection of theism). Also, although not central to this discussion (though potentially useful), for general purposes I submit that scientific views are all by definition philosophically grounded since (a) science employs no methodologies that are philosophically inconsistent, and (b) scientific views require logical consistency, which is in the purview of philosophy. Thus, science makes no claims that are philosophically either unsound or out of bounds. However, this cannot be extended to mean that all science-informed views are philosophically grounded. Each ingredient in the view-stew has to be evaluated separately. But we can categorically include all scientific ingredients. 1) Is the belief that the Earth is (more or less) spherical a scientific belief or a philosophical one? 2) Do you accept that belief in the truth of a proposition A necessarily implies belief in the falsehood of all propositions that contradict A? 3) Is the belief that an expeditionary force of nigh-undetectable aliens are making it look as though the Earth is spherical (by affecting the path of photons before they reach our eyes, etc) when in reality it's cubical, a scientific belief or a philosophical one? 4) Is the belief that the aliens described in (3) don't exist a scientific belief or a philosophical one? I don't know how appropriate it is to do on your blog, Massimo. But, I see a lot of post here and on Jerry "The 900 Foot Jesus" Coyne's blog that one may expect. However, two have popped out at me from Big Jesus' site I want to share (or just parts of). This one cracked me the hell up. "More current terminology"? What the hell is this person talking about? The "strong sense atheism" and "weak sense atheism" which is now "very weakest atheism" and this use of the acronym is all new to me, and some of it is pure gobbly gook. Even the "strong atheism" and "weak atheism" demarcations are not that old, so Big Jesus comes up with a third to fit science in and now its all the new terminology to knock philosophy out. Unbelievable, but funny shiat. I think this is a good one to go over because Russell Blackford is the Big Jesus' go to guy for philosophy. It's really awful. He's doing what he did with his "supernaturalism" arguments which is dance around grotesquely, and fill his void with "what if" thinking not based on anything meaningful much of time. I do however think there's two points worth quoting that illustrate the annoying habit Blackford has. "Limiting the kinds of arguments?" This clearly shoes a lack of understanding the argument presented by Massimo. It all is an important feature of Blackford's thinking which has influenced Coyne and now other regular readers of their blogs. He does this repeatedly with not being able to tell the distinction in arguments. I just want to add one more thing then I'll let this thread go. I could have told you the primary focus would be on "atheism" from your post - especially since you take two of some of the most well known vociferous atheist to task concerning their arguments regarding atheism, especially Dawkins. I'm not sure of your intentions from here - it's been strange to watch the extension of arguments like Big Jesus' & Blackbird's since the publication of the God Delusion. I'm not sure what George Smith is doing these days, but his explicit/implicit boundary almost looks attractive now. I've stuck my neck out a few times since '07 on this issue, especially with the claim of the "supernaturalism" within the realm of science (which is primarily the argument Big Jesus' Blackbird uses), and it's basically sucked. So, I'll be interested to see where you go now. If I had to take a guess, you'll let it dry up then chalk it up to friendly disagreements. To bad I say. They don't equate postmodernism with philosophy, they just view postmodernism as being a huge part of philosophy. And it is. The definition of philosophy that analytic philosophers generally accept holds no trump card against other definitions. Belief (1) is scientific; (2) is a matter of logic, so it is philosophical; (3) and (4) are a matter of science unless you are claiming that the aliens are supernatural entities. *That's* the crucial distinction. thanks for your comments, you put the finger exactly on what is wrong with Coyne's, Dawkins', and Blackford's scientism. Science gets liberated, not "limited" by not having to deal with the supernatural. Unless you are one of those scientists who think that science is the whole of human knowledge, an epistemologically arrogant and increasingly insufferable position. postmodernism is a minuscule part of philosophy, and it has been in retreat for the past decade at least. But of course most scientists wouldn't know it because they don't pay attention to philosophy (which wouldn't be a problem if they were also not arrogant enough to criticize that which they do not know and disdain to know). Then again, most scientists still think falsificationism is a cool idea, even though philosophers have moved beyond it, let's see, thirty years ago! "science can study the supernatural"
"the supernatural is within the realm of science"
"science can falsify the supernatural"
"science has something to say about the "supernatural" - this is the knee jerk response to explaining what science is actually 'doing'. They have all been direct claims by atheist. Most often supported with Loch Ness monster type thinking or science falsified the claim the earth is 6,000 years old (yea, sure did, even before Darwin, glad you recognized my fellow freethinkers). What is common is, well lets tell a short story - Steve Zara, made famous by his copious commenting on Dawkins' site, once after me telling him that we can test the claims of the religious (falsify the age of earth, even do a damn prayer study if he wants - atheist love prayer studies but love to hate those that do them, go figure) and he kept insisting that I was saying that we can't test claims because someone claims they have "supernatural" causation (I swear I was only trying to explain the distinction between the claim and what science is doing, by gawd I should be damned to hell). After he made clear that we all must stop saying science isn't in the "supernatural" bizzness, he proclaimed publicly that my argument was racism, yes racism. To make his point he posted a link to some Catholic wackjob cardinal who says he has "supernatural" powers (one day, I hope this will seem as bizarre as it really is to more rational people). Seem confusing, it is. Why? No idea really. My working theory is Dawkins got hot and bothered after Gould had the gumption to take his noma essay idea into book form (Gould could make a sentence into book length Richard). So, in came the responses (including Massimo's in Skeptic and elsewhere, such a young intelligent lad), which many people had. No problem there, love the debate, healthy etc. Plus I didn't share some of Gould's more religion friendly stuff, but he made clear it's personal and that he was an amateur historian. Ok, fair enough but when his idea trickled down it washed out in an ocean of anti-religious rhetoric and I'm still frustrated at him for not seeing that coming and being more prepared. Besides that, the demarcation he created people saw, as Massimo does, as to black and white, giving to religion what they don't actually have to begin with (a terribly shallow misreading I'm afraid, but the interpretation, after continuous repeating, has become "truth"). Anyway, Richard wanted to get out there his response to Gould - and he waited quite awhile to get a book out on god, and the time was ripe to attack both. Historically, this is very true I believe and in the future I think it will become more evident of the importance the role of historical events played out instead of the actual argument made that created the greatest impact to our intellectual discourse and understanding. So, to counter Gould doing what we all understood anyway (though done with his style which meant being to nice perhaps), which was to get a strong fence up to protect and free science from worthless "supernaturalism" garbage and get the religious to move along or get their asses whopped, Richard decided to make "supernaturalism" a cause celeb for science. To in fact put "supernatrualism" back into science, where it never actually was (unless you message your argument with sweetness like Richard has). That's the theory, and if you read Big Jesus and his philosophy king, you see Richard's stamp quite clearly. There are trivial concerns here, like the influence a Zara or Blackford has in the internet age. It has become obvious, painfully so, that many rationalist get vertigo on this debate and want to play the "don't touch my science with your limiting rhetoric game" or we all fall to our deaths. perspicio: If science entails that one must withhold belief on matters that aren't empirically testable, then doesn't it follow that one must withhold belief on the claim that "science entails that one must withhold belief on matters that aren't empirically testable"? Actually, I did get that far. In fact, I had to read it 3 or 4 times (and go look up a few things) to really understand it, in part because of your seemingly stream-of-consciousness delivery (no offense), but more because I am largely uninformed on the ebb and flow of contemporary discourse on this subject. Now see what you've done? You've enticed me away from core principles of logic and science, where I was quite comfortable, into the squooshy play-by-play realm of contemporary debate. Damn you! > the demarcation [Gould] created people saw, as Massimo does, as [too] black and white, giving to religion what they don't actually have to begin with (a terribly shallow misreading I'm afraid, but the interpretation, after continuous repeating, has become "truth"). I don't care about the interpretation that has become "truth" as much as what you think a less shallow/more correct interpretation would be. (1) "Withholding Belief". This implies that there is an impulse to advance belief, and action required to prevent this. We need make no such assumptions, so long as it is clear that any such belief is outside science's purview. The term "non-belief" (not to be confused with "disbelief") is sufficient. (2) "Entails." Non-belief on matters that aren't empirically testable is not entailed by (in other words, is not a logical consequence of) science. It is the default position of skeptical inquiry. Stating that science supports non-belief is sufficient. "Science supports non-belief on matters that are not empirically testable. That is a claim I would stand by. It's very, very important to state these things as neutrally as possible because science is a tool for observing and analyzing, not directing outcomes. Since the act of studying an event intrinsically adds additional dynamics to it, the scientist's challenge is to simultaneously minimize and take account of this contribution, and one aspect of doing that is to approach his work without expectations. Incidentally, this is why disbelief (not non-belief) in unfalsified claims is scientifically inappropriate. It signifies bias on the part of the observer, and will tend to influence every aspect of his investigation, from how he designs his experiments, to what he observes (or doesn't observe), to how he interprets the results. In some instances, this bias can affect what actually occurs. If science supports non-belief on matters that aren't empirically testable, then doesn't it follow that science supports non-belief on the claim that "science supports non-belief on matters that aren't empirically testable"? To this I would answer, no, because science's support for non-belief on matters that aren't empirically testable is empirically testable. Oops - I stopped one foot short of the finish line. The fact that the argument is empirically testable is not of itself the reason why science doesn't support non-belief in it. Naturally, it is appropriate to maintain non-belief throughout the testing process. The reason is because, upon enacting that empirical testing, we find that science DOES support non-belief on matters that are not empirically testable. I presented the components of the argument that demonstrates this earlier in this thread. Namely, (a) it is within science's purview to evaluate claims to determine whether or not they are empirically testable, and (b) if they are not, non-belief in them is scientifically appropriate because in the absence of evidence to investigate, science has nothing to say either for or against them. Point (a) is not a scientific position, but rather belongs within the philosophy of science. It is open to dispute, of course, but I know of no serious, merit-based contentions on this matter. Therefore, I maintain that a sufficiently skilled scientist is qualified to evaluate whether or not a claim meets the benchmark of empirical testability. Point (b) follows purely from scientific methodology. The empirical testing of this argument comes from observing how any new claim that turns out not to be empirically testable is treated by science. In my second question, I only asked if you accept that "belief in the truth of a proposition A necessarily implies belief in the falsehood of all propositions that contradict A", not if it's a philosophical belief. Assuming that you do accept this, I'm puzzled that you would treat the aliens I described in my third question differently if they were supernatural (whatever that means). If belief that the Earth is spherical is scientific and if this belief is logically equivalent to the belief that "all propositions that contradict 'the Earth is spherical' are false", doesn't it follow that this last belief is scientific as well, even if some of the propositions that it is about include supernatural entities? There is absolutely no empirical evidence that could contradict that sort of statement, but a philosopher can easily point out why it is unreasonable, and that furthermore it creates very serious theological quandaries. I'm somewhat confused by this statement. There might be no empirical evidence to contradict that sort of statement, but surely there's the flip-side as well: that is there's no empirical evidence for such a statement and there is scientific grounds to dismiss it (i.e. all we know about the nature of time doesn't work that way). If someone were to present the Omphalos hypothesis, I would reject it on the grounds that such a conjecture contradicts the nature of nature. That to me feels like I'm still using scientific grounds to say it is unreasonable, and that science does have a say on particular matters. Perhaps my rejection of Omphalos that way is naive, or I'm overextending the scientific method. Please help me to understand. I have to agree with several other commenters. I think you missed it with, "Second, let us turn to atheism. Once again: it is a philosophical, not a scientific position." Theism is a positive statement about what exists in the universe. That makes it a scientific question. Science requires positive empirical evidence to accept claims made about what exists in the universe. To date, theistic claims have failed to meet the empirical threshold. If there is a philosophical question there, it is whether science should be relying on some other form of epistemology? But, with science's proven record (as compared to all competitors) to date, I don't see any serious challenges coming in the near future. "Lastly, let’s consider political philosophy. Again — just like with atheism above — it would be silly for a political philosopher to reject pertinent empirical claims: we do have some evidence from the social sciences and from history about what happens when certain economic or political systems are seen at work in human societies. But political philosophy is fundamentally a matter of values"
Probably the single most concise and accurate statement about politics I have ever read. The most compelling political arguments are always those seek a consensus of values first. I don't think of atheism as a philosophy any more than I think of "lack-of-belief-in-gremlins" as a philosophy. I don't agree with the Venn diagram. Skepticism entails allowing the evidence to sway you towards a conclusion. We CAN use evidence to say that there is no MORE evidence for any ONE god than for the MANY we don't believe in. And we also know that humans are prone to inventing supernatural entities to explain that which they don't understand. These two simple facts are enough to make a provisional conclusion that god is no more likely to exist than gremlins. I would call that position "atheism", wouldn't you? It's the opposite of theism which, unlike atheism, claims "special knowledge". the case of supernaturalism is different for a variety of reasons. One is that some theologians maintain that god created logic, which means that if the aliens were supernatural even your second question would have a different argument. I'm not saying this makes any sense, I'm saying this is why supernaturalism is best dealt with philosophically - because it is ultimately impervious to any empirical evidence. the above applies to your comment as well. I really don't understand why so many people equate statements of "existence" with scientific statements. Science is a very powerful but epistemically limited activity. "Existence" is a broad philosophical concept that does not imply, by any means, empirical evidence or testability. Hence, it is outside of science per se. (e) Atheism is therefore the appropriate scientific stance with respect to theism. So, which parts of this do you disagree with, and why? Do you care to elaborate on what this "atheism" is so we can actually interpret what your diktat is directed at? You've pulled quite the trick. You assert (offering neither definition nor argumentation) that atheism is non-scientific, though it is philosophical. This implies that that you consider the proposition to be self evident. If that is the case, then why even argue it? You've taken a decidedly peculiar rhetorical tack to communicate with your interlocutors. Perhaps you should refrain from preaching to your choir and engage the particular issues which cause your dissenters the most problem. Second, let us turn to atheism. Once again: it is a philosophical, not a scientific position. Now, I have argued [...]"
So, you claim to be prepared to define atheism. Then when you get down to it, you define (more or less by fiat) that it is a philosophical position, offering not a scintilla of justification. Then you criticize those who you claim argue for a scientific atheism. That's one of the most egregious cases of question begging "definitions" I can recall among worthy authors. I think your arguments gain very little traction against someone who views atheism in the way perspicio does. And, just out of curiosity, what utility does incorporating the concept "supernatural" into such a debate have? I can't find it. In your reply to Furcas (the first time in this thread you use the term), you seem to put many or all of your eggs in the "atheism = philosophy" basket with the use of that dubious term. How does it illuminate? What distinctions does it serve to make? We can discuss what we have observed or though, define a logical system, investigate what that logic tells us, examine the implications uniformitarianism (God acting would be a violation of that), etc. But what possible usefulness is there in employing a term that is so incoherent. The standard definition is "beyond scientific understanding or the laws of nature" and most people tend to use it that way too (all the way from god on down to your lowly garden fairy). Does this mean that anything that evades science is supernatural? Or does this mean that the laws of nature are somehow out there and can be breached? If that's the case, is the problem not with the definition of the laws of nature? I don't want to play the role of gadfly anymore than I already have, but seriously, if you want to treat these issues, at least be clear about what you're saying. Having thought about it, having read more answers here and at other blogs that have reacted to this post, I still do not get it. Why exactly is atheism a philosophical position? It is basically nothing more than the rejection of a factual claim, the claim that gods exist. This position can be held due to philosophical reasons (e.g. by showing that the supposed characteristics of god are self-contradictory, that the whole idea is illogical, etc. ), or it can be held due to scientific reasons, i.e. lack of evidence that should be available if the god hypothesis were true. But the factual claim and its rejection are definitely not only in the realm of philosophy. The only way you can throw scientists out of the discussion is if you define theism as not a factual claim. But if it is a factual claim, then science has expertise to deal with it (I would even argue that it is the only approach that can reliably deal with factual claims, but then I am not a philosopher). Of course, you brought the Last-Thursdayism example as not being addressable by science, and one could also bring in the deus odiosus concept, a god that does not do anything at all except existing in an undetectable manner. Both, however, are self-evidently useless concepts that can be safely ignored even without studying philosophy for 5+ years. The only god that is worthy of any discussion at all is one that has some kind of impact on the universe; by having this impact, it becomes detectable; by becoming detectable, it enters the realm of science. Bottom line: science is about everything (except pure sophistry), and that everything includes the deity question. I agree with (a), (c), (d). I do not agree with (e) because I reject (b). third, I maintain that the best stand for science about the supernatural is one of claiming categorical mistake: science simply doesn't apply to it, just in the same way that it isn't a scientific question whether or why I prefer jazz over punk rock, or whether numbers are "really out there" or are a human invention. one more time (con sentimento): atheism is not the rejection of a factual claim, because theism is not about (empirically verifiable) facts. That's what makes atheism a philosophical, not a scientific position (unlike a rejection of Nessie, pace my philosophically naive colleague, Jerry Coyne). Really, people, I don't understand why you feel this compelling urge to expand the epistemic status of science to encompass the whole conceivable universe. It only gets scientists and science itself into endless trouble for no gain whatsoever (and for bad reasons). Well, I have presumably given this less thought than you, so I could very well be mistaken, but I do not see it how science can not possibly encompass the whole conceivable universe. Either something has an effect on the universe, then it can be observed, rejected or verified by science, or it does not, and then we are pretty safe to assume that it does not exist. You cannot have it both ways; the latter situation is what the celestial teapot metaphor was invented for! Firstly, theists make plenty of factual claims, and they are rejected all the time. Theism is a lot about factual claims, actually. The only scientifically unassailable theism is of either the deus odiosus or the Last Thursdayism (LT) variety and not only useless as an intellectual concept, but also useless to theists. What good is a god that does not answer your prayers, create the universe or bestow an immortal soul upon you? Your argument makes sense if you mean that the rejection of LT cannot be based on science; okay, maybe (although I would prefer to say that the rejection is inbuilt into the scientific method). But do we need to call it philosophical therefore and tell scientists that they are not qualified to comment on that? I mean, an average 8-year-old should in principle be able to see the problem with LT.
Secondly, and I repeat myself, no sensible atheist and certainly not the likes of Dawkins has ever made the claim that they, or science for that matter, can rule out the LT god. They just use their expertise as scientists to say that there is no evidence for gods, that, if the god question is addressed in the same unprivileged manner in which we today rightfully (because it works) prefer to address all other questions about the nature of the universe, then the answer is "no evidence". Maybe you can point me to where exactly somebody has overstepped these bounds, but I have read the God Delusion, God is not good and God: the failed hypothesis, and that is their position. Stenger in particular takes pains to discuss which possible gods are not ruled out by the data or cannot be tested at all. According to your last comment, Russell's flying teapot example would not be a propos? Massimo, I truly appreciate your response. As far as I know, this is the first time you've specifically stated the basis of your opposition to actual statements I've made delineating my position. Thank you for addressing the matter directly. This argument appears empty on its face, since in my statement I specifically mentioned another position, which you did not acknowledge: disbelief. Thus, it has not been established that we are talking about a dichotomy at all, false or otherwise. I confess I'm a bit astounded that you would make an argument that is so clearly assailable by the directly stated content of the very claim it is against. I wonder whether you simply didn't read the claim carefully, or whether you would argue that disbelief is not, in fact, a third position, but rather a subset of one of the other two. In such a case it behooves you to elucidate this view. However, even if you do so your argument has the even more basic problem that nothing about my statement relies upon a belief/non-belief dichotomy for its veracity. Whether there are two, two million, or an infinite number of possible positions one might take toward a claim, among all of them the only scientifically supported perspective toward it in the absence of empirical evidence is non-belief (aka: abstention from belief, a nullity of belief). Well, naturally, sir! You have to land a blow to make a dent! In an earlier thread, I presented a position that Massimo felt free to essentially dismiss out of hand. The idea is this: whatever exists, the idea that it does not have some definite being or modus operandi is incoherent - we aren't really talking about something that exists unless there are concrete facts about it, and the only things that can exist about it are things that are concrete (after all, vagueness is a problem of perception. Nothing really is "vague" in and of itself). I think this is at least a non-ridiculous stance, if not an obviously correct one. Within this framework, the entirety of reality can be viewed as a system of interacting parts. The physicality or non-physicality of a subject then has no bearing on whether or not it can be scientifically analyzed, unless we unnecessarily demarcate science such that science only applies to the physical. Massimo can get fancy-schmancy and say that there really could be things that don't follow describable laws, but I haven't heard a solid argument from him for this. Massimo is right that there are just some questions that the human race will probably never be able to test scientifically. We surely cannot test the question "was the entire universe created five minutes ago by an omnipotent being?" But there are questions about the physical world we will never be able to answer as well. We will never (let's be real here, folks...) be able to test the questions "are there creatures in the Cigar Galaxy that have a game similar to soccer? If so, do they dive while playing it as much as the 2006 Italian National Team?" This sort of question is, I admit, beyond the realistic grasp of science. I can understand why Massimo believes that there are practical issues with testing many scientific claims. And there are some that, for certain theoretical reasons, cannot be tested. But I think that Massimo has a tendency to accept theoretical restrictions on the methods of science that I don't. > Either something has an effect on the universe, then it can be observed, rejected or verified by science, or it does not, and then we are pretty safe to assume that it does not exist. You cannot have it both ways; the latter situation is what the celestial teapot metaphor was invented for! > Russell's flying teapot example would not be a propos? Russell used the celestial teapot analogy to make a philosophical point, not a scientific one. Science has nothing to say about whether the teapot exists or not, other than that nothing we know about the universe can be construed as evidence in favor of it. Thus, while we can conceive of it, science does not encompass it. I see your point. It was a toy example, as it were. > The physicality or non-physicality of a subject then has no bearing on whether or not it can be scientifically analyzed, unless we unnecessarily demarcate science such that science only applies to the physical. I would argue that this is the appropriate demarcation, observing first and foremost that the entire body of accepted scientific knowledge pertains to physicality. Science has not proven effective at analyzing non-physical abstractions (which we nevertheless have concrete facts about) such as values, opinions, or mathematics. That is clearly the province of logic unencumbered by scientific sensibilities. Can we extend the limits of "scientific sensibility" in order to make it more effective at this type of analysis? Perhaps, but I suspect this would amount to reinventing logic under the banner of science. I think that a lot of this boils down to an impractical obsessiveness about drawing (and erasing) firm boundaries between philosophical disciplines. If a scientist reaches a logically consistent position for or against a claim, but strays outside the boundaries of scientific inquiry to do so, is it less valid? Why must we concern ourselves foremost with whether an argument is scientifically valid or not? Shouldn't baseline validity be our primary concern? Much of this ado about nothing derives from the pushback against an organized assault of illogical claims on rationality from religious quarters. Science has marshaled an army to wage this fight. Since its findings are demonstrable and repeatable in very physical ways, it is a formidable and undeniable presence on the battlefield. Philosophy, on the other hand, represents the special forces, taking out the opposition from afar before it has a chance to engage the ground troops. These skirmishes between science and philosophy are ridiculously counterproductive, but it's not surprising considering that many of the scientists involved in this effort see their task as eradicating bunkum, and from its perspective anything that is not concrete smells like bunkum. So they sometimes end up bashing philosophers and theologians alike, which of course generates some blowback from philosophers. This is actually a failing of these scientists. The role of science in this effort is to establish a network of bases and strongholds of rationality, and maintain a solid defensive line protecting them. Their role is not to go off into the weeds and engage the enemy on their turf. That's the philosophers' job. When the scientists do that, they are actually not operating as scientists, but as philosophers, whether they know it or not. There is so much embedded bias in both camps now that they can scarcely communicate with each other at times. For example, Massimo appears to think that I am assigning too much authority to science by claiming that it should appropriately assume an atheist stance. But this in fact explicitly releases science from rendering an opinion on the theist claim, which is what he argues for, not against. Why the apparent contradiction? I can't say for sure, but I think it's because many otherwise rational scientists have transgressed the boundary between non-belief and anti-belief in theism, thereby allowing bias to enter into their views and radicalizing them to take an activist approach to the matter. As a result, atheism has been polluted and misappropriated to the point that its misuse has achieved a false air of legitimacy in many circles, such that using it appropriately is apt to trigger a thoughtless defensive reaction on the part of many otherwise rational thinkers. And so both sides have become prisoners to their unquestioned biases. Can a peace treaty with theism be far behind? 1. Then science as such is also based on philosophical positions, and the whole discussion becomes a bit silly. 2. Calling this philosophical is a bit grand; usually people think of great logical or moral discussions when they hear the term philosophy. These aforementioned concepts are more on the level of what every human being from a cave-man 20.000 years BCE to my 3-month-old dauther uses instinctively as criteria to understand the world. Because it works, not because they have philosophied about it. And these concepts are used for every area of discourse except the weirdly privileged area of religion. So if you call that philosophy, then so is everything, and again the whole premise of the discussion is a bit silly. 3. The original post had undertones of annoyance at those atheist scientists who use their science to inform their atheism. I do not understand why - obviously science has much to say on the matter, especially about the gods theists actually believe in, even if you may need tools outside of science to discuss Last Thursdayism (which is not a serious position anyway). It sounds a bit as if nobody should be able to call themselves atheist or discuss the matter unless they are philosophers. > Science has not proven effective at analyzing non-physical abstractions (which we nevertheless have concrete facts about) such as values, opinions, or mathematics. > This is actually a failing of these scientists. The role of science in this effort is to establish a network of bases and strongholds of rationality, and maintain a solid defensive line protecting them. Their role is not to go off into the weeds and engage the enemy on their turf. That's the philosophers' job. When the scientists do that, they are actually not operating as scientists, but as philosophers, whether they know it or not. But the theists do make factual claims that are in the realm of expertise of the scientist to address, constantly. Would you ask a philosopher if you wanted to know if the universe started in a state of higher order than today, if life was created in "kinds", if we have a soul that survives physical trauma, if our morals have an evolutionary or rather a divinely revealed basis, if Jesus was likely a historical figure or not? No, in all these cases you would ask people who work evidence-based. And basically every god with the only exception of one that is of no use to a believer (and therefore not point of any discussion anywhere anyway) is, at least in principle, assailable by scientific inquiry. > But the theists do make factual claims that are in the realm of expertise of the scientist to address, constantly. Yes, and provided that these claims are cast in a fashion that makes them empirically testable, we can eliminate certain gods, or at least certain interpretations of gods, from consideration using scientific means. But there is an inexhaustible supply of them. > And basically every god with the only exception of one that is of no use to a believer (and therefore not point of any discussion anywhere anyway) is, at least in principle, assailable by scientific inquiry. I'll leave it to the believer to decide whether a particular concept of god is "of use" or not. In any event, saying they are almost all "assailable" suggests an anti-theist position. But that's putting the cart before the horse in a purely scientific examination of the subject. If you rule out even one god from scientific consideration, then you cannot arrive at an anti-theist position using science alone because there is no science-based reason to disbelieve in a concept of god that has not been examined. Thus, the strongest possible science-supported view on theism in general is one of non-belief (atheism). Maintaining an anti-theist stance in the face of this is outside the bounds of science, and bringing it into the practice of science introduces bias. In many instances we can address individual claims about proposed entities, and often shrink them incrementally or banish them from touching the world as a result. Therefore, disprove the gods of interest or reduce them to the level of that one that you cannot examine directly, and be satisfied with non-belief rather than disbelief in that one. > I'll leave it to the believer to decide whether a particular concept of god is "of use" or not. Me too, but I do make some observations about what gods people actually believe in. > Thus, the strongest possible science-supported view on theism in general is one of non-belief (atheism). Maintaining an anti-theist stance in the face of this is outside the bounds of science, and bringing it into the practice of science introduces bias. Okay, so suddenly atheism is okay, it is only anti-theism that is a problem? Fine for me. But these are not the words in the original post. As I wrote and as far as I know, Dawkins et al. never claimed to be able to rule out all possible gods, so atheism it is. However, they can easily disprove Jehovah or Allah, as these gods do come with a lot of factual claims that make them Jehovah etc. as opposed to the pantheist concept of god. So it does work, or let us say it works no worse than a philosopher's attempt at convincing the unconvincible. I'm saying this is why supernaturalism is best dealt with philosophically - because it is ultimately impervious to any empirical evidence. Thank you for the reply Massimo. I'm still somewhat confused on this matter regarding your example of those arguing the transcendental argument for god. I remember coming across someone who used that argument, and I found that ultimately the way I got him to back off from his argument was to tie it to an empirical observation. That is if you put two blocks with two more blocks you get four blocks. While this is hardly philosophy of mathematics (I seem to remember my kindergarten teacher demonstrating maths to me this way), it feels to me like I'm basing my rejection of such an argument on the grounds of an empirical claim. The only philosophical rejection of the claim I could think of is a variation of the Euthyphro Dilemma, though this is more probably lacking to my lack of philosophical training. My question in all this stems back to my original question. Why is philosphy better than empiricism when it comes to questions of this nature? With arguments like the TAG argument or Plantinga's evolutionary argument against naturalism, all my points of refutation feel like scientific rebuttals as opposed to philosophical ones. I'm not trying to destroy your position, just understand it and where my inquiry should focus to correct my limitations. Because to me, the best refutation of Plantinga's argument is paper after paper that shows varying degrees of animals being able to utilise the environment around them, just as I think the best refutation of the TAG argument involves using counting blocks. What area(s) of philosophy would better equip me to understand such arguments? Of course, I am only giving you my view. I suspect Massimo would still disagree with you, as he does with me. I really enjoyed this one! However, I disagree with you slightly. I agree that one cannot make definitive, scientific claims about the whether there is a supernatural or whether a higher consciousness exists outside the natural realm. However, when one claims that the supernatural intercedes in the Natural world in any way, then it becomes the realm of science. Creationist arguments, the power of prayer, the sun standing still for warriors, virgin births, and zombie saviors all make claims that defy the natural world as science describes it. In short, absence of evidence is not evidence of absence but absence of evidence that should be there is sufficient evidence to assume absence. We can rule out the Judeo-christian God as described by a literal reading of the bible. The more mystic, metaphorical the claims become (ie. God is love) the more agnostic I become. I've met your "false dichotomy" claim head on, and countered it. I've even taken the proactive (and logically unnecessary) step of dismantling the notion that dichotomy is a logical requirement of my argument in the first place. In response, you appear to be simply ignoring this and walking away as if nothing happened. I'm rather disappointed by that. My argument appears to make no more of a dent on your views than yours do on me. The difference is, I've successfully defended my argument, which is why my views have not changed. You, on the other hand, appear to simply withdraw from the argument when your blows miss their mark, and then reassert yourself making same points elsewhere as it pleases you, as though they had never been been seriously contested. That does not strike me as intellectually honest. Maybe you're too busy to engage in the debate in a serious manner. That's okay, of course, but in that case there's not much point in taking your views seriously in the first place. Is there some other explanation I'm missing? I'm sorry you are so terribly disappointed, but perhaps you haven't noticed that this blog is not my source of livelihood. I need to pay much more attention to my students and colleagues than to these discussions, as enjoyable and informative as they are. Unfortunately this means that my engagement is only partial, I throw the initial stone and occasionally come back for more, but the blog is meant as a forum for general discussion, not as a way to have one-on-ones with me. I did not mention your third position (disbelief) because I thought we agreed from the beginning that that is certainly not a scientifically tenable stance. My argument is not "empty on its face" because what I proposed is that science has nothing to say on the matter of supernaturalism (I referred to categorical mistakes, if you recall), which is not non-belief, belief or disbelief, it simply doesn't apply. As Wittgenstein famously put it (in a different context): Whereof one cannot speak, thereof one must be silent. Actually, Massimo, the purpose of your blog is for us to argue with you. One-on-one. If I get into graduate school at CUNY-Lehman, it will be they who pay me to argue with you. Well, Massimo, as usual I do appreciate your response. Also, I can certainly respect that this blog is not and cannot be your top priority, and that this necessarily means only partial engagement on your part. For my part, I confess that I sometimes focus in on objects of interest to such a degree that things that ordinarily might be taken for granted may require more explicitness for me to notice. Also, since I am unemployed I have lots more time to do this than the average person. It's a mixed blessing. In any event, in the future I'll refrain from assuming that you are necessarily able to spend the time necessary to defend the views you express in this forum. Additionally, let me say that I was careful not to cast any accusations and only expressed my perceptions, but in light of your response I can certainly appreciate that I might have appeared impolite. My apologies if you have taken any offense. Without expectation of rejoinder (though hopeful of it, as I'm convinced that with the successive constraints we're putting on this matter of dispute, we are on the cusp of its resolution), I will provide my response to your latest argument in the forthcoming post. absolutely no need to apologize! I wish I could spend more time on this blog, which I consider an important part of my outreach as an academic. > I did not mention your third position (disbelief) because I thought we agreed from the beginning that that is certainly not a scientifically tenable stance. Fair enough. In casting about for clarity on the precise nature of our disagreement, I was not fully convinced that we had achieved consensus on that point. > My argument is not "empty on its face" because what I proposed is that science has nothing to say on the matter of supernaturalism (I referred to categorical mistakes, if you recall), which is not non-belief, belief or disbelief, it simply doesn't apply. (1) I did not address this argument before because it was presented as a supporting reason for your claim of false dichotomy - a claim which I reject on the basis that I neither asserted nor relied upon the idea that there could be no other possible scientific positions toward a claim than belief or non-belief, and thus did not posit a dichotomy. However, neither has it been established that they do not constitute a dichotomy. Since non-belief is, as I've repeatedly stated, a nullity of belief (as opposed to a belief of zero magnitude), it must therefore be an attribute of every conceivable position which does not entail a degree of belief, including "category mistake". Thus, stating that the theist claim is not a scientific one by reason of category mistake does not contradict the position that non-belief is an appropriate scientific stance towards it; rather, it supports it. It might contradict my statement that non-belief is the only appropriate scientific stance in such a case, but doing that requires demonstrating that "category mistake" is a both a scientific stance in its own right, and that it is distinct from "non-belief". As you might expect (though not out of sheer cussedness, as you might also suspect) I submit that "category mistake" is not a scientific stance. Reasoning is below. (2) We have both accepted previously that it is within science's purview to assess whether or not specific claims are empirically testable. This seems eminently reasonable, as it is necessary to preserve science's autonomy within its own native sphere rather than requiring it to rely upon external authority to render judgment on which claims it is qualified investigate. Moreover, a claim's non-testability can, as a practical matter, be arrived at empirically, simply by trying and failing to find a way to do so. This allows for the possibility of claims (such as special relativity or string theory) that are excluded from scientific inquiry at some point to be included at some later point, when a means to test them has been identified. Science is unconcerned with the why of testability, merely the whether and the how. The "category mistake" argument is interesting because it widens rather than narrows the scope of scientific inquiry (which, significantly, you argue against elsewhere). Prior to this point we have not accepted any view that endows science with the ability to assess claims ontologically. Yet, “category mistake” is an ontological concept. Although accepting this area of logic as part of the scope of scientific reasoning may provide a means for it to classify certain types of claims as outside of its domain, this is a superfluous attribute to assign to science. The only things that science is concerned with are those which pertain directly and demonstrably to physicality. Providing specific reasons about why something does not meet this benchmark may be philosophically interesting, but ultimately it is scientifically unnecessary. Thus, conducting ontological assessments is inconsistent with the philosophy of science, so “category mistake” is not a valid scientific view. You argue that widening science’s scope to include ontological assessments saves it a lot of trouble addressing claims it can never test. Thus, you argue for an efficiency of the scientific process – in essence, the inclusion of a labor-saving device. But the most notable strength of scientific model derives from its most pronounced inefficiency: repeatability. Doing the same things over and over again and getting the same results may be the definition of insanity, but it is the backbone of science. We should be unconcerned with the efficiency of science, and celebrate its grinding, inexorable effectiveness. Ah....grad school. I'm itchin' for it, but it seems so far out of reach right now. I wish the very best of luck to you, though! I certainly don't see the category mistake argument as expanding the scope of scientific inquiry, on the contrary, because to me making a category mistake means that one has actually nothing to do with the other (it is not an expansion of basketball to say that it has nothing to do with home runs, to use a sports analogy). I really do think that scientists should walk away from talk of the supernatural *unless* (as I wrote several times before) the believer is making factual claims about the age of the earth and the like. But it is important for a scientist to realize that refutation of that sort of claim does not amount to a refutation of the supernatural (Dawkins' and Coyne's mistake). I'm not so sure Penn Jilette's "bizarre denial of global warming" was necessarily other than (scientific) climate skepticism. The line is often blurred between the [irrational] denial of "obvious fact" and the rational questioning of an unsupportable certitude. I think this is one more case of where science and philosophy intersect. It's a dangerous mix, I agree, the rules of one do not ride well against the other. I too, wish they could be of separate kingdoms, but I'm not so sure they will ever be totally divorced. I really do think that scientists should walk away from talk of the supernatural *unless* (as I wrote several times before) the believer is making factual claims about the age of the earth and the like. So you get to decide who is allowed to open his mouth in a discussion? That is neat. And again, show me one theist who does not make factual claims, one believer who promotes a god that can only be discussed philosophically, and I'll show you more than four billion believers who would consider that person basically an atheist. But it is important for a scientist to realize that refutation of that sort of claim does not amount to a refutation of the supernatural (Dawkins' and Coyne's mistake). And what is supernatural anyway? I have never understood that distinction. If it has any effects, then it can be observed, then it is part of science. Everything that exists or happens is by definition part of nature, even souls or ghosts - the only meaning of the category supernatural is "sorry, you are not allowed to examine that with logic and evidence, I get to believe whatever I want, just because". What there is are concepts that are conceived but not observed in nature, such as justice, but that is not supernatural either, it is just a human invention. Yeah, I know, we really do agree down to all but the finest of points on this. Category mistake does indeed mean that one has nothing to do with the other, but rendering such a judgment with respect to science requires a position transcendent of science. For example, science cannot identify a supernatural claim as supernatural per se, because it can only ascribe attributes to things it can sense in the outer universe. Things it can't so perceive, it knows nothing about. Some such things are inconsistent with its working models, but science would immediately begin reconsidering those models if it could sense such things directly. As such, science does not know what its own category is in any absolute sense, but only in the relative sense of what it knows how to perceive right now. I am basically treating science in as minimalist a fashion as possible, since that is the most reliable way to prevent bias from finding a hiding place in it. Hence, I am treating it as "dumb, but pure," in the sense of it only knowing empirical things. If it can conceive of but not "touch" (test) a claim then it knows empirically, through past trial and error, that it cannot evaluate its attributes with any certainty, so it doesn't assign any belief value to that claim whatsoever. Under this view, it could never say why it cannot touch a particular claim, only that it has exhausted all known ways of doing so without success. Thus, it cannot distinguish between supernatural and merely supersensory claims, and therefore it cannot with certainty claim category mistake. The unmitigated strength of this approach is, the very principle that prevents science from rendering a judgment of category mistake on a claim endows it in a single stroke with the ability to permit, without bias or precondition, the maximum range of possibilities (the set of all things that can be conceived) to extend into the universe of touchable things, while maintaining a perfect track record of only granting scientific status to possibilities that actually do so protrude. Now, that is unbiased. In my view, allowing science only a single organ by which to sense the external universe disambiguates the delineation between it and all other methods of knowing with a clarity and simple elegance that is becoming of a well-considered, well-cast theory of knowledge - an aesthetic characteristic that science itself has no way of perceiving...but someday might. On the other hand, allowing science to invoke categorical mistake doesn't actually prevent it from saying something about a claim; rather, it permits it to say something extra about certain claims, namely that they are not merely untouchable, but that they never could be. Permitting science the power to reject certain claims on an abstract categorical basis in this fashion is equivalent to granting it ESP - the ability to sense without sensing, as it were. Ironic, no? Massimo, I hope that you're aware that, as an academic, it is your duty to have inscrutable idiosyncrasies that amuse students and fellow faculty alike. If somebody stops, has a brief conversation with you, and then asks you if you've had lunch yet, respond by asking "that depends; what direction was I walking when you stopped me?" My math lecturer today was trying to illustrate how you should approach applied math problems differently from abstract ones. He phrased it like this: "most of you are not going to be pure mathematicians, so you have to think about what's happening." This in-and-of-itself makes me consider becoming a pure mathematician. stops you* I meant to say. First, it is self evident to me that religions are not exclusively concerned with the "supernatural". They deal with value judgments made by their followers. They also deal with material claims that are correct (or approximately so). They also deal with material claims that are self evidently wrong. They deal with material claims that are contradictory both within and between religions. They deal with community conventions, accurate history, inaccurate history, etc. Let's also allow that religions deal with some topics that cannot be the target of anything but philosophical consideration, like your definition of "supernatural". 2) atheism properly understood is a the reaction only to the nonmaterial/supernatural aspects of religion while science properly understood can be invoked only with regard to the other claims of religion. The former is transparently false for so many religions and so many religious believers that I don't believe it merits serious consideration. The latter is enormously question begging. Is there something I'm missing? One more (longish) post to expand on why I see it as counterproductive to use the language "supernatural" (which is why I use scare quotes so often). Perhaps I'm missing some crucial nuance here. If you are making the claim that "science cannot make claims about the supernatural" then I'll perhaps agree with you provided this is a definition. It doesn't seem like a particularly controversial OR useful axiom. 2) Touchy-feely incoherence. God is the mystery behind our lack of understanding. He is perfectly unconstrained, but interacts with the world, but is impervious to any study. Except we (or at least some of us) know enough to make claims about him. He isn't physical, but he can do physical things. He can't be observed except he is observed. He is completely beyond our understanding, except we may understand that he exists, he gives laws, he hates homosexuality, sassy kids, and shellfish. Basically, I'm saying any definition of "supernatural" is either just a way of describing an insufficiently general understanding of "nature" (point 1) or an incoherent concept (point 2). If point 1 is the case, then we are "supernatural" to the australopithecines or even to uncontacted hunter/gatherer tribes. This is an unsatisfying definition for supernatural as it is relative to an arbitrary level of knowledge of the user of the word "supernatural". In the second point, how can a claim ever be made about something supernatural? If it is supernatural, how could it ever impinge on our consciousness? While, scientifically, it may be impossible to reject the supernatural, for humans (that bundle of sense organs bundled to a brain) we must somehow interact with the supernatural to even say anything about it, by definition. If something is really truly supernatural and impervious to science, then believers can have no interactions with it either. We either sense god through touch, taste, smell, vision, hearing, or any of many other kinds of sense. At the very least, there must be some "sensus divinitatis" to sense god from, or else we don't know anything about god. Once observation is made of god, that brings god into the realm of science. Again, I don't think defining god or religion as supernatural is at all productive and really just exploits unfortunate semantic connections to run our brains in non-productive loops. I can accept an arbitrarily powerful entity, an arbitrarily intelligent one, or even an arbitrarily elusive one. But defining that entity as supernatural seems to have no benefit whatsoever, except to short-circuit this very conversation, and as such appears question begging. My feelings exactly (see post above), but you may have expressed it more clearly. ...political philosophy is fundamentally a matter of values: one starts with certain “rights” for instance that one thinks ought to be safeguarded, and then builds the best political/economic system that is likely to do the job. The selection of "rights" that one starts with would be a matter of arbitrary (though firmly held) choice. One has "belief" for these values, in the sense that they motivate behavior, although they are not supported by evidence... it isn't clear what it would mean to have evidence that "people shouldn't torture babies for fun". By previous definition, then, one holds this kind of value by "Faith". So you would agree that in the area of Political Philosophy it is appropriate for Atheists and other to act from Faith? not at all. Values can be described and defended rationally. That's the whole idea behind political philosophy, theory of justice and moral philosophy. Bingo! Yahtzee! Slam dunk, home run, and no category mistake. A perfectly valid restatement of part of my positivist argument. > 1) To crib from Asimov just a tad "any sufficiently advanced technology is indistinguishable from the supernatural". This is an adjunctive form of the supernatural, in that it doesn't attempt to explain anything particular phenomenon that we perceive, but rather posits a nearly seamless, quasi-metaphysical envelope that encloses all that we ordinarily perceive, and that is accessible in some abstruse yet phenomenological manner (i.e. Morpheus's red pill). Since we're going there, Clarke also said, "The only way of discovering the limits of the possible is to venture a little way past them into the impossible." Although he may have said this tongue-in-cheek (and probably with no pill in his mouth), it is an adequate statement of the delineation between science and non-empirical philosophy. Since science is only interested in the limits of the actual, it (a) has no basis for engaging in this venture, and (b) must therefore remain forever open-minded about untested possibilities. Quasi-metaphysical flavored supernatural remains on the table, but at this stage science does not have long enough arms to reach it. If and when it does, non-empirical philosophy informs us that while it may be a delicious recipe, it will turn out to have all-natural ingredients. > 2) Touchy-feely incoherence. God is the mystery behind our lack of understanding. He is perfectly unconstrained, but interacts with the world, but is impervious to any study. Ah yes, my favorite: the god of the shadows. It touches the world wherever we are not looking right now. It is the manifestation of the possibilities that cease to be when probability fields collapse due to direct observation. It populates the unknown with a secret agent that can only be perceived through direct revelation. It is the ultimate ninja: unseen, unheard, everywhere and nowhere, so slick that its every action appears to be naturally caused. It leaves its lack of footprints everywhere as its calling card. Yeah, well...science has to live with that one, too. It cannot dispel the possibility of its truth. Hand that one off to a philosopher. There is an important distinction to be made between belief, and faith: one may be informed by evidence, while the other explicitly precludes this possibility. As a further matter of clarification, values or beliefs being evidence-supported simply means we can observe their existence empirically. But values or beliefs being informed by evidence means we generate those values or beliefs based on evidence of some other thing. Neither case posits that a particular set of values or beliefs is "correct". I take it you agree that there can be no empirical evidence for or against value propositions like "people shouldn't torture babies for fun"? Do you mean to say that 'values (as above)' form a third category of assertion, distinct from '(evidence-based) belief' and 'faith'? Can you please say what it would mean to defend a value proposition rationally? that's right, there is no empirical proposition that can decide a matter of value (though empirical propositions can and should inform our understanding of values). That's precisely the difference between philosophy and science that I've tried to make throughout this post. As for examples, I can give you references, and a great place to start is John Rawls' Theory of Justice. But you can also pick up any book on moral philosophy to see what I mean. That referred to the post immediately above: there is no such thing as supernatural. Why the philosopher? As argued above, you can call that philosophy and claim that only a fully trained philosopher is qualified to discuss this, and Dawkins has to shut up and never dare to criticize a catholic bishop. Or something. Or you can all it common sense and wonder what we would need a philosopher for that. To be honest, I do not have the foggiest idea why I would need a philosopher's input at all. If all theists would stick to the god model that cannot be tested by science, there would in fact be no use in the approaches of atheists such as the ones that MP is somehow annoyed by, that is true. But there would also be no need to bring philosophers to the front then, as that kind of god could be safely ignored by the unbelievers. Dawkins doesn't have to shut up at all. He and others should just recognize that, while his argument is logically valid, it possesses a non-empirically derived attribute: assignation of belief value to an idea that can be mentally conceived, but that has not been physically observed. As such, the argument is not (purely) scientific. Science builds models to explain observed phenomena. That's all it does, ever. Claiming a personal god probably doesn't exist because it is inconsistent with scientific models requires using logical tools that science doesn't possess to wring additional information out of the body of knowledge that it does possess. Assigning additional evaluative capacities to science that allow it to draw conclusions beyond those that apply directly and exclusively to empirical data amounts to attempting to smuggle non-empirically-derived belief values into science through a back door. Not only does Dawkins do this, but I submit Massimo does it as well when he invokes category mistake as a scientific judgment, because category mistake carries information about the claim that cannot be observed empirically: namely, that not only is it inconsistent with current working models, but that it could never be consistent with any such models. I agree that discussions of values should properly fall under the rubric of "critical thinking", eg, consistency, proper use of implication, and so forth. 1. Evolution is a useful tool for explaining the world as we see it, and predicting some future consequences. Both examples require people to examine them for meaning ("what is evolution", "what is torture"). In the first example, we expect people to agree and accept it because it is "true"; the meaning corresponds to the evidence, which can be presented and examined. If we don't call it 'Faith' then I think we need to refine the definition quoted for example by perspicio or in your (Massimo's) post to this blog from April 14 this year.) Perhaps something like, "Faith is defined as belief in an unsupported assertion about the empirical world." Then maybe "a Value is defined as a non-empirical assertion which is intended to constrain behavior." Well, your question is actually two questions with a self-referential twist that leads to an infinite regression that cannot be logically resolved (and therefore yields no comprehensible results from in situ critical analysis). On the first question, any number of different factors, either singularly or collectively, may underlie a person's adoption of this or any particular values proposition. A few possible reasons include hedonistic sensibilities (i.e. the practice does not lead to happiness), acceptance of a pre-existing dogma or doctrine (i.e. the Spaghetti Monster Bible says "No"), or social pragmatism (i.e. the practice causes more societal harm than good), to name only a very few. The list of possible rules that the proposition may be a consequence of is quite literally infinite, so it would be impossible to provide a comprehensive list of them, much less to reapply the parent question to each. That doesn't mean that on a case-by-case basis there is never a specific answer to be found that doesn't invoke faith, though. I think it's safe to say that the question as it has been cast is logically flawed, although it is perhaps possible to generate a finite list of categories that such rules may belong to. On the second question about what justifies making one person's rule a rule for everybody, I would say that invoking the concept of law places the discussion squarely in the realm of political philosophy, which deals with particular attributes of social relationships. On this basis, we can fairly non-problematically cleave to "greatest social good" as a core defining principle in order to determine which rules "should" be laws. However, defining social good and assigning weight to instances of it is plenty problematic in its own right, even without considering that some behaviors might be good for society in certain instances, and bad for it in others. > "a Value is defined as a non-empirical assertion which is intended to constrain behavior." I would call the thing you describe a rule (or law) and I would add as a caveat that the statement is only a fully functional definition if we define inaction as a form of behavior, so as to including assertions that not only say what one may not do, but also what one must do. I think a value can be described much more sparely simply as a preference. I do not think that invoking a categorical mistake is a scientific judgment, it is a philosophical one. Note that the very concept of category mistake is philosophical, it does not appear in the scientific literature. I fully agree with your latest statement, but then I don't know how it is reconcilable with your earlier statement that "I maintain the best stand for science about the supernatural is one of claiming categorical mistake." How can a philosophical judgment become a scientific stand? Hmm, sorry, but that didn't clear it up for me at all. How is that different from what you said before? If scientists can claim categorical mistake, that means they can render a philosophical judgment, doesn't it? Why isn't it enough for a scientist to simply say, "Science has no means at this time of evaluating that claim, because it does not pertain to any aspect of reality we are currently able to observe. Science cannot explain why non-observed things are not observed, only that they are not. Go ask a philosopher. She might know." allow at least some scientists to know enough philosophy 101 to call in reinforcements when they need them and get out of the game! Of course there are scientists who know enough philosophy to render the categorical mistake judgment. But, as you say, they are not doing it in their capacity as scientists, for the specific reason that science itself is not equipped with the requisite tools to render that judgment. As such, the categorical mistake claim is not a scientific one, even if it is made by a scientist. It is acceptable for people to doff one hat and don another. They can move in and out of different categories of thought. But the categories themselves do not move with them. This all goes to the importance of preserving the integrity of the epistemological boundaries of science, which is where this conversation of ours began, and it has very specific implications not just for the philosophy of science, but for its practice as well. Since beliefs inform our perceptions to some degree, failure to respect these boundaries risks introducing bias into our observations. If one scientist rightly claims categorical mistake but wrongly does so under science's banner, another scientist who does not understand the ontological basis of this claim might accept it as scientific fact, which may misinform him about other scientific matters. Over this time this can lead to a systemic bias that, by virtue of its ubiquity, is very difficult to perceive. Massimo, thank you for the pointer to Rawls' book. I read the introduction online and ordered a hard copy from Amazon, and I look forward to digesting it more completely. Each person possesses an inviolability founded on justice that even the welfare of society as a whole cannot override. For this reason justice denies that the loss of freedom for some is made right by a greater good shared by others... justice [is] uncompromising. With this as anchor, he has quite a lot to say about how societies should be ordered; that is, using methods of critical thinking, he extends this simple premise into a "political philosophy" with various action programs. Note that there are incompatible alternative premises, eg, "Justice preserves the essential features of the State", or (explicitly denied) "Justice delivers the greatest good for the greatest number". Why does Rawls select this as his Value? As Perspico suggests, there could be any number of psychological sources, but al fundo this is a 'Credo', a personal assertion, a stake driven in the ground here and not there. The mechanism doesn't appear to be any different than a religious person's Faith in a god of a particular description. What would be the difference between Value and Faith? (I am attempting to use Massimo's vocabulary here) Apparently, Faith is not-true and Value is neither-true-nor-false. Belief, I suppose, starts off as a conjecture, a hopeful monster made of the same stuff as values and faiths, and becomes Belief when confirmed as true. What should we think about a particular religious system, such as Shinto or Orthodox Christianity? It starts with a more or less simple Credo, which gets elaborated into abstract philosophy and social action, just like Rawls' program. The process of elaboration would proceed by critical thinking and ratiocination. So I see the left inner circle on your diagram has been correctly relabeled "philosophy of religion" with various alternatives arising therefrom. Since religious systems typically produce a social action program, the religious philosophy circle should overlap with the political philosophy circle. Once we have got a religious sect as a political organism like others in the the social body, we can evaluate and treat it like any other. Practicing a religion should be seen as political behavior, subject to the usual rules of politics. By focusing on Behavior, we can avoid worrying about whether a secret friend should be more like an invisible pink unicorn or a flying spaghetti monster. Hitchen's God is Not Great is wonderful for speaking to the inappropriate abusive privileges that religion has often claimed for itself, which we should not tolerate any more than racism. However religious values are afloat in the social body because there are people that hold them, and the collective values are derived from the values of all the people in the collective. So I don't see any reason why traditionally religious values (such as the Ten Commandments) should be excluded just because they are associated with evidence-free faith (such as Verbal Inerrancy). Eg, Abortion is a serious moral issue which should be debated by religious and secular together. Eg, science should be taught in science classes; philosophy should be taught in philosophy classes. The distinction between Philosophy and Science seems to me valid and useful. The distinction between Faith and Value, not so much. Clarke. I can't believe I'm blushing at an error I made in a comment thread, but I am. > there is no empirical proposition that can decide a matter of value (though empirical propositions can and should inform our understanding of values). > That's precisely the difference between philosophy and science that I've tried to make throughout this post. I find little to disagree with regarding this perspective. But I find it a little bit provocative for you to go that extra step and assert that "atheism is a philosophical position" unless you also claim that atheism's only proper stance is to reject the philosophical claims of religion. Like Mintman said "If all theists would stick to the god model that cannot be tested by science, there would in fact be no use in the approaches of atheists" like [insert your favorite "new" atheist here]. I wholeheartedly agree, but the transgression of the religious are quite diverse, and an atheist can spend all of his free time answering the purely material claims without ever once donning his philosophical hat. And the reason that the arguments of the "new" atheists tend to be so cumbersome is precisely because they don't usually seek to tackle the non-material claims of religion. On the contrary, they get deep into the empirical weeds of religion precisely because their critiques are grounded in those bits of religion that (probably inadvertently) impinge upon the scientific arena. Even though many theists will in fact retreat to defending the "god of the shadows" (I like that turn of phrase, thanks perspicio!) many are loath to do so any earlier than they deem necessary and will in fact play the empirical game for as long as possible. Thus, we atheists who are trained in science are well justified chasing those interlopers out of the scientific territory. If philosophers want to make a raid into the non-material Neutral Zone, by all means, have at it. I don't see many scientists willing to stake their scientific credibility on such endeavors (as worthy as they surely are). But just because philosophers CAN attack the religious (and are sometimes the only ones who can) doesn't mean that atheism doesn't find support in science at times, too. Well, of course science works with non-scientifically derived concepts. These include "we can, at least in principle, trust our senses", "the universe is understandable", and, most importantly for this discussion "things for which evidence is lacking that should be there if they existed probably do not exist". All of these are basic assumptions that were not originally developed with the scientific method itself, as obviously you have to start at some point and take some leap of faith. They are, however, much more than "belief values", as you quip so postmodernistically. They are justified by working consistently over centuries, by not disappointing us ever after the initial leap of faith taken to accept them. Is that philosophy? Well, maybe, but then everything is. Claiming little green men from Andromeda probably didn't build the pyramids because it is inconsistent with scientific models requires using logical tools that science doesn't possess to wring additional information out of the body of knowledge that it does possess. Claiming phlogiston probably doesn't exist because it is inconsistent with scientific models requires using logical tools that science doesn't possess to wring additional information out of the body of knowledge that it does possess. Hooray for the weirdly privileged status of religion, no, where this patently ridiculous sentence suddenly sounds thoughtful? We scientists do claim stuff like that all the time. You tell us we can't do that because we are not philosophers. But that is silly, because we scientists are never saying anything more than that this is probable/not probable as far as our scientific evidence goes. And that is also, at least implicitly, all that those scientists are claiming who say "no evidence for god". This is going in circles, obviously. So in concise summary, I hope, my position one final time: Yes, philosophy is perhaps necessary to reject the penultimate shadow god a believer will retreat to if pressed (if you want to call cognitive assumptions supported by a history of working well philosophy). However, why bother calling in philosophical reinforcements? Firstly, even non-philosophically trained scientists can play the celestial teapot card, and that is all that is needed to deal with the shadow god. Secondly, such a shadow god is of no consequence anyway. Any god of any consequence can sooner or later be ruled out (or proven - now would that not be interesting if it ever happened) by science, even if the theists' whack-a-mole games may in principle go on for eternity. It won't, though, as the appeal of religion really lies in a few, easily and long refuted ideas, such as the wishful thinking of possessing an eternal soul. Religion does not persist because we foolishly failed to ask a professor of philosophy to step in, but because the believers do not want to stop believing no matter who steps in. >Science builds models to explain observed phenomena. That's all it does, ever. Claiming a personal god probably doesn't exist because it is inconsistent with scientific models requires using logical tools that science doesn't possess to wring additional information out of the body of knowledge that it does possess. 2) the most parsimonious scientific models that do not posit a god explain the data equally well (and sometimes better) as those less parsimonious models that do posit a god. Scientific models for many disciplines directly conflict with empirical claims about personal gods very frequently. In such cases, our observations are more consistent with the scientific models than they are with the theistic models. I suspect that they would say that they are basically paraphrases of each other, with the first being short but imprecise and the second being cumbersome. Hell, I'm a scientist, and I'll go that far. Anyway, if anyone is to start castigating scientists for saying things mirroring #1, then you'll have to do it with at least one article in practically every issue of every science journal. And for many of those journals (especially Science and Nature) every issue will likely be composed almost entirely of articles manifesting such "philosophical transgressions". Ultimately, both god and traditional models are abstractions that lack material basis. If we're careful with language (#2) we can quantify our uncertainty surrounding how well competing models fit the observations. But if we aren't careful with language (#1) we may very well say: "Phenomenon 1 (described by model 1), not phenomenon 2 (described by model 2), is the reason why we observe what we do." I wonder how many angels can dance on the head of such a fine point? I really enjoyed reading your formulations on values and politics. The subject matter is engaging, and had I not homed in on the atheist argument so exclusively, I might well have devoted a fair amount of time to this area of discussion. As it is, I'm glad you took it up. > By focusing on Behavior, we can avoid worrying about whether a secret friend should be more like an invisible pink unicorn or a flying spaghetti monster. Yes! I remember a dull gleam of this concept shining through the extremely pitted and tarnished surface of mainstream religious sensibilities in the US now and then during the presidential campaign last year. Pretty much only on the Obama side, of course. Rick Warren's question about how to handle evil leaps to mind. > collective values are derived from the values of all the people in the collective. So I don't see any reason why traditionally religious values (such as the Ten Commandments) should be excluded just because they are associated with evidence-free faith (such as Verbal Inerrancy). Me either, but it's not just because of that. Far from it. One major trouble lies with the appearance of an official recognition or sanctioning of a particular viewpoint by allowing a symbol of a certain constituency's values that specifically excludes another constituency's values into the public sphere. Some people believe that any symbol of a system that contains such exclusive values must be eschewed. Others feel that only explicit expressions of exclusive values are to be treated this way. (i.e. a crucifix might be okay while the 10 commandments are not, or the 1st 4 commandments are out but #s 5-10 are in). Of course, a lot of people would probably advocate elimination of all expressions of values from the public sphere entirely - with the exception of their own. Personally, I advocate locally equitable, reciprocal inclusivity, with a lower-limit-representation threshold. That is, if there is a place in the public sphere for one subset's values, then space must be made available in the same locality for any others that wish it - but only to the extent and degree of the original one, and only provided they represent a sufficiently large percentage of the local society's constituency - say 5%. So if any of these mute symbols is welcome at, say, city hall, then so are all the others to the very same degree (one twelve-foot statue deserves another, maybe several) even if one symbol reflects 85% of the population's values and another only 10%. The reciprocity extends also to the nature of the symbol (a statue of the 10 commandments earns a statue of, say, The God Delusion), because it is not okay for one group to offend another's sensibilities without allowing that other to offend the first in a similar manner. Damn. Now I want a job in social policy. Or as a judge, so I could offend everybody. I wondered whether anybody would take up those counterarguments. I'll respond, but not now - it's 6:30 AM and I've been up all night. I have no problem with scientists saying philosophical things, and vice-versa. I encourage it, and all manner of scholastic cross-training in fact, as long as the statements are accurate. But I wouldn't agree that information that is extracurricular to a given school can imported into it. So no matter what you say as a scientist, your saying it doesn't bring it into science's body of knowledge, even if it's true. >I have no problem with scientists saying philosophical things, and vice-versa. >So no matter what you say as a scientist, your saying it doesn't bring it into science's body of knowledge, even if it's true. Of course. But it is pretty wishy washy to say "I'll bet some scientists might say X!" when I could simply recall, "Wait, I'm a scientist! I say X!" In any event, the argument doesn't hinge on the identity of the person making the claim. The point was that, donning scientist garb only (I guess we're talking hats) you can advocate wide swaths of atheism. That's all. I'm not saying all facets of atheism are supportable by science. the main difference between religion/faith and rational values as the object of moral philosophy is that in the latter case one builds arguments based on reason. Well, I just got my 8th wind, such that it is, so I think I'll crank through this. I hope I'm as coherent as I think I am. Trust of our senses is our default position as humans, is reinforced by (most of) our experiences, and requires no cognitive formulation. For example, we trust that we will not fall through the ground when we endeavor to walk, whether or not we have ever thought about it. It is an emergent phenomenon. Only when our innate trust proves unfounded do we begin to employ reasoning faculties. Avoiding ambiguous (to me) semantic connotations that might lead me off into a discussion of phraseology, and instead interpreting the words the way I think you mean them, I would argue that this belief results from direct experience, and is therefore empirically derived. When as infants things don't work out as expected (we fall when we try to walk, we cry and mom doesn't come, etc.) we start trying things. Eventually, mom arrives, we are able to our feet and take another step, etc., and we trust that whatever we tried works (whether or not it did), until it doesn't. At that point we try other stuff again, and so forth. The algorithm is self-assembling; hence also emergent. "The universe is understandable" is an embedded belief. It may only exist as a concept as a consequence of reflecting upon our experiences, hence it is an empirically derived concept. > most importantly for this discussion "things for which evidence is lacking that should be there if they existed probably do not exist". I think I require a concrete example to parse this appropriately (apologies if you've provided one previously), but on its face I'm not convinced that this is a scientific idea. In purely evidence-based analysis (aka science, at least as I am casting it), we cannot assess probabilities regarding non-evidential things - and in any event, no scientific process requires us to do so. Such things are off the scientific radar utterly. Provided we have a concept to describe the thing for which we have no evidence, the only thing we can say is that the idea exists, not that the phenomenon it describes does, does not, or might. As scientists, we allow for any of these possibilities, but favor none of them. As philosophers, we may have other ideas. > All of these are basic assumptions that were not originally developed with the scientific method itself, as obviously you have to start at some point and take some leap of faith. > We scientists do claim stuff like that all the time. You tell us we can't do that because we are not philosophers. Not true. You absolutely can, and if you do you are acting as a philosopher, not a scientist. You can't do it as a scientist. > But that is silly, because we scientists are never saying anything more than that this is probable/not probable as far as our scientific evidence goes. And that is also, at least implicitly, all that those scientists are claiming who say "no evidence for god". Yes, scientific knowledge may quite legitimately inform philosophically grounded positions. No disagreement there. As I said, hopefully I am as coherent as I think I am. Let me know. The reason I'm putting such a fine point on this is because we know (empirically) that our beliefs can influence our observations, and our observations can even affect the phenomena they pertain to. So in constructing robust scientific models it behooves us not to introduce non-empirically-derived beliefs. > The point was that, donning scientist garb only (I guess we're talking hats) you can advocate wide swaths of atheism. That's all. I'm not saying all facets of atheism are supportable by science. In the absence of empirical evidence one way or the other, atheism is the only appropriate stance toward the theist proposition. If we postulate the hypothesis of the historicity of the exodus of the Israelites from Egypt as described in the bible, the hypothesis calls for finding some traces of their wanderings in the desert. While archaeologists have unearthed traces from neolithic hunter-gatherer camps, nothing has been found that would indicate such a large number of Israelites wandering through the Sinai for 50 years at the right time. Thus we are justified to reject the hypothesis because evidence is lacking that should be expected to be present if the hypothesis were true. The example is actually taken from Stenger's book, as I am not an archaeologist myself and my biological examples would require too much exposition. Now suppose, as a second example, we hypothesize the existence of an immaterial soul that actually carries character traits and memories. If this hypothesis were true, then purely physical trauma to the brain should not change character traits or delete memories. Enter cases of people with brain damage or strokes. Some lose memories, some lose abilities, some people who were once sweet and gentle become complete sociopaths, etc. The evidence that should be there if an immaterial soul as described above existed is lacking, thus we are justified to reject it as a hypothesis. This is, by the way, one of these "of any use to the believer" issues. You can still postulate the existence of a soul that does not code for our character traits as unassailable by science. But how could this soul then be punished for evil or rewarded for good behaviour if it does not actually carry the good or evil character that is responsible for these deeds? You can still postulate the existence of a soul that does not contain memories as unassailable by science. But then what good is it for the believer who lives in terror of the annihilation of their personality that death brings? Now the same approach goes for gods in general. Evidence is lacking for the createdness of the universe; for souls; for an afterlife; for the feasibility of influencing your fate through prayer or sacrifices; for any special purpose or place of humans in the universe. And believe me, people have searched for such evidence. Thus we are justified scientifically to reject all god hypotheses except those that are completely irrelevant to humans. Massimo said: the main difference between religion/faith and rational values as the object of moral philosophy is that in the latter case one builds arguments based on reason. You're not saying that religious argumentation is necessarily incoherent, I hope? The Vatican spends much effort making their discourse systematic. You may disagree with Karen Armstrong's ideas, but I haven't heard anyone criticize her scholarship. Augustine, "a towering figure of midieval philosophy". Not to mention the vast Buddhist literature, etc etc etc. "All arguments come from assumptions", quite so. And they can only be justified, as Mintman said, "by working consistently over centuries, by not disappointing us ever after the initial leap of faith taken to accept them." And Science has been uniquely successful in providing (...somewhat...) simple explanations about interesting topics such as the cladistic nature of the biosphere or how to build large, stable, affordable buildings. One of the assumptions or axioms of Science is Atheism... "no god" or demons in the Chem Lab jiggling molecules in extra-thermodynamic ways. When we are trying to have a Science discussion, we agree not to posit effects due to Divine Intervention. It would seem easy to stop arguing about this.... but sadly not. The relation of Science to "Reality" is fraught; not even whole generations of post-enlightenment philosophers have been able to work it out. For example, Quine. But who cares? We know what we mean, and we get good results. More to the point, Science doesn't give results for all concerns, such as the moral or political as we already agreed. We have to add axioms to achieve a workable moral or political system. Of necessity, the added axioms will not be Empirical in the Scientific sense. Rawls' new axiom, previously quoted: "Each person possesses an inviolability...". Science will never be able to demonstrate an "inviolability", but Rawls proceeds as if it were true and gets good milage. It is not more incoherent or fatally flawed to add an axiom about the existence of a "God" having whatever nature and proceed as if it were true. Different ideas have different consequences; we should argue about consequences, not axioms. Axioms are not arguable. De gustibus non est disputandum. Having results in conflict with Science is a bad thing, even the Vatican agrees. Rawls' axiom seems completely secular, but we can easily reify it in different terms to read, "Every man has a Soul that God cares about". If the arguments after that are homologous and the results identical, or at least compatible, why argue about a choice of terms? As opposed to Science, the unique advantage to religious thinking in the ages since Lascaux was painted seems to be in its ability to nucleate group formation. In the current age of the world, it seems obvious to me that is something we really really need to know more about, not chase away with pitchforks. hmm, I actually do think that much religious argumentation is either incoherent or non rationally defensible. The part that is rationally defensible, like Augustine's, or better Aquinas', can very effectively be criticized on philosophical grounds. That's the problem with religion: if it's taken to be a matter of faith, then rationality just doesn't enter into it. If it is defended on rational grounds, it is pretty easy to show that it is not a tenable position. And I don't particularly care for Armstrong's ideas either, I find them rather vacuous and fluffy. But of course that would take a whole other post. Massimo hoists belief in the rationality of morality on a slope above belief in the rationality of mathematics. So, he basically says, if you're going to reject morality, what next? Math? Acceptance of basic moral axioms is also on a slippery slope above acceptance of just about any obscure axiom anyone wants to invent. If one claims (by some axiom taken at face value) that some things really are right or wrong, you could also say that Miles Davis is cool in some realistic sense (not just a subjective sense). I find this slope much more dangerous and philosophically obtuse. I really find it suspect to compare an axiom like Modus Tollens to the belief that happiness is a fundamental good. One of them is a fundament of reason - there just is no reason without logic. The other one is not a key component of reason. "theism is not about (empirically verifiable) facts"
Massimo, you've defined the terms such that you can't be wrong. Your conclusion is ineluctable from your definitions. Perhaps you find some intellectual satisfaction from considering the least ridiculous form of theism, i.e. the "god of the shadows" who shuns empirically verifiable interactions. Fine, have fun with that. It is important. I understand why combating the ridiculous incarnations of theism (YEC, e.g.) would be entirely unappealing to you. Cada uno a su gusto. But it is hubris for you to declare that the target of your intellectual pastime is the "proper" understanding of religion. Not only that, it is flat out wrong unless you are willing to label a lot of people "improperly religious". If the only consequence of your advocacy were a peculiar convention that could be allowed in your seminars and only imposed a translation burden on your seminar guests, that'd be fine. But no, sitting as you do, on a perch of academic distinction, you spread your convention in a very damaging way. I am already beset by cries of "science can't speak to religion!" when I try to explain that the fit of any model to empirical evolutionary phenomena is worsened when the interlocutor's personal god is part of said model. This isn't philosophical. The fit doesn't improve AND I'm forced to add more parameters. Good scientific reason to reject inserting god into the model. Of course, such religious people don't pursue the nuance like you have here. Rather they just dogmatically assert the same perspective you are espousing here stripped of the nuance (ironic eh?). I have never had a debate with someone who believed nor have found the need or desire to struggle against a religious idea that fit your non-empirical standard that defines the way you see "theism". Now, just change your terms "theism" and "atheism" into "deism" and "adeism" then you wouldn't be running roughshod all over established conventions and I'd have no qualms with your post. And you wouldn't appear so allenorresque. "Science is a very powerful but epistemically limited activity." Alright Massimo, educate me here. Exactly what would/should I look at as existing in the universe, that I would apply some other epistemology beside empiricism to make a high probability prediction? I'm making case for empiricism, not science per se. If the scientific establishment decided tomorrow to adopt revelation as an epistemological standard, I'd drop it like a bad habit. To me existence, by definition, implies interaction. When it comes to understanding interaction, science by far has set the bar. If I should adopt a better definition for existence please point me in a direction that would change my mind. What a load of codswallop, or should I say, godswallop. First, atheism is not an ideology, it is an absence of one. It is scientific because it doesn't make claims, it tests them. Just as in science those who draw conclusions and only select evidence to fit are considered frauds, so it is with religious malarky. Second, atheism is predicated upon the same basic rule of logic is science and the law: all propositions are deemed false until proven true. Only verifiable data is collected, only things which are falsifiable are considered, and only theories which are testable are accepted. To talk of atheism as a philosophy is to lend false credence to religion. Such credibility has never been shown by any religion, and never be given. I said science was epistemically limited, I didn't say that we have a better way to go about studying reality. Moreover, examples of things that are simply not accessible to science, and yet are foundational to its function, are easy to find: try to justify the fundamental scientific principle of induction; or to prove scientifically that there is a physical world out there; or try to tell me what exactly are the laws of nature. And so on. please read what I wrote carefully before commenting: I never said atheism is an ideology (although it can be, for some people). I said it is a philosophical position, which it is. As for the role of science in atheism, I believe I have explained my position clearly and ad nauseam. If you don't agree you don't agree. Thanks. I do continually try to better understand philosophy. Sometimes I just need it presented a little more directly. You did that and I am grateful. 1)"try to justify the fundamental scientific principle of induction"
Well, if you were discussing magnetic induction I would present volumes of evidence and ask for any refutations. But I assume you are asking about logical induction. I can justify it for two reasons. One it works (is that pragmatism?). If I drop a ball four hundred times and it falls to the ground, how could I not assume on the 401th time it won't fall to the ground again? Two, it's tentative. If on the 401st toss the ball rises, I either must establish possible uncontrolled variables or withdraw my theory of gravity (I would look for the variables). Either way, is there a methodology out there that has higher probability of describing the world as we see it and making successful predictions? Is there a way of knowing that says I should ignore the first 400 tosses and then base decisions on ignoring them? 2) "to prove scientifically that there is a physical world out there"
Got me there. We could all be living in the Matrix. Good enough. If Morphius comes to me on my computer I'll take that up for action. In the mean time, c'mon! Is anyone actually going to argue for that as a world-view? Let me see them live it first. 3) "or try to tell me what exactly are the laws of nature"
Again, you got me, I can't. But neither can anyone else. However, if you want to understand nature as it exists and make accurate predictions about what will happen in the future, the methods of science are MAGNITUDES more accurate than any competitor. Like I said, the laws we come up with are tentative. But that is what makes them so successful. Consequently, if someone wants to propose that being X exists and that being X has an effect on the natural world, science is still the best (although given not perfect) arbiter have that question. To deny that, is to deny such a large body of evidence that it is equivalent to expecting the ball to fall up. That is my take. It may very well be philosophically weak. Like I said, I'm not philosophically oriented. But in the world I live in, actions have consequences and there is no substitute for the data. If there is a better way, I'm willing to learn. On induction: "One, it works ... Two, it's tentative." Wouldn't disagree. But to say that it works is to use inductive reasoning, which is logically circular. To say that it is tentative doesn't add anything to its justification. Philosophy of science offers very interesting and intricate discussions of induction and other bases for science, and one learns a lot (and becomes more humble) by becoming familiar with them. "c'mon! Is anyone actually going to argue for that as a world-view?" No, that's not the point. The point is to show that by far the *biggest* claim to existence (i.e., the one that applies to the entire universe) cannot be substantiated by science. If *that's* not an example of "someone proposing that X exists and that X has an effect on the natural world" I don't know what is. Which undermines your third point. On the laws of nature: "you got me, I can't. But neither can anyone else." How do you know? There are sophisticated discussions in philosophy about what laws of nature are, and even whether they actually exist, and these discussion are completely unknown to most people, who nonetheless gingerly proceed with grand statements about the powers of science. Much thanks for keeping the conversation going and on target. perspicio: Like Massimo, I reject your principle (b) about science requiring non-belief for the non-empirical; I offer mathematics and logic as counterexamples that are very useful in science. External realism is possibly another, though I suppose it could be argued that isn't a supposition of science. Your talk of preserving the epistemological integrity of the boundaries of science doesn't seem to me to be consistent with the actual history of science, in which those boundaries have regularly been demonstrated to be quite flexible. Thomas Gieryn's discussion of John Tyndall's distinctions between science and religion, on the one hand, and between science and "mechanics" (engineering), in his 1983 paper on "Boundary work" makes the case pretty well, I think. Massimo: Reading your latest in _SI_ about pure vs. applied science made me also think of Gieryn's paper, and Plato's distinction between episteme and techne.